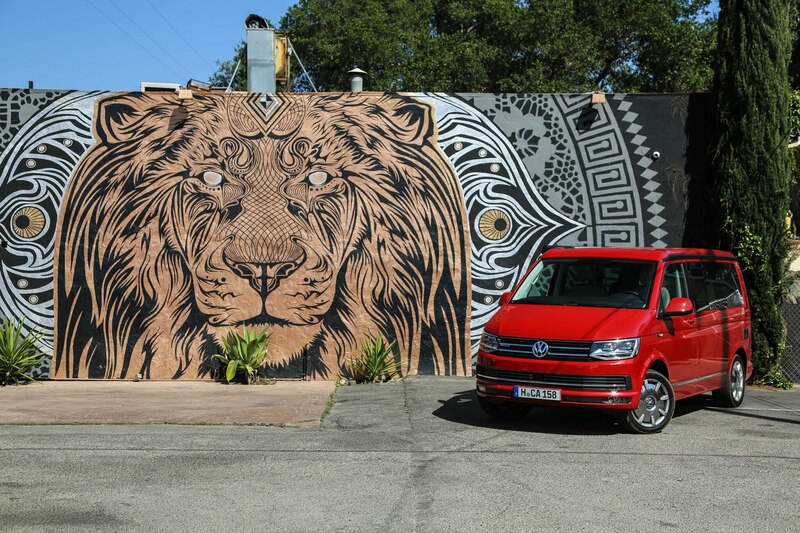 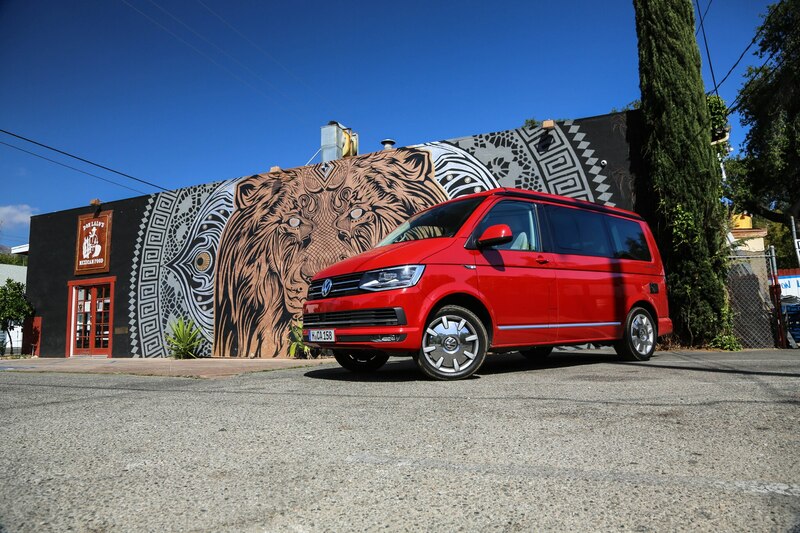 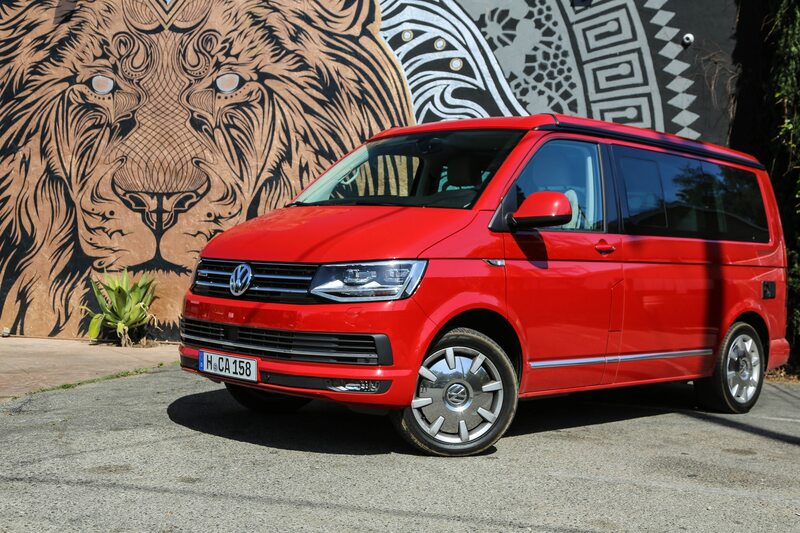 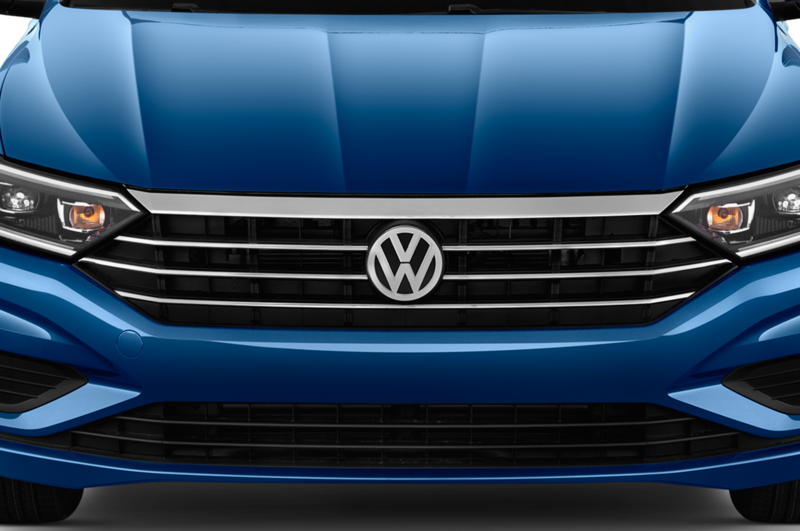 LOS ANGELES, California — In case you weren’t aware (we’re guessing most of you aren’t since it’s no longer sold here) the Volkswagen T6 is the sixth generation of VW’s long-running Transporter van series. 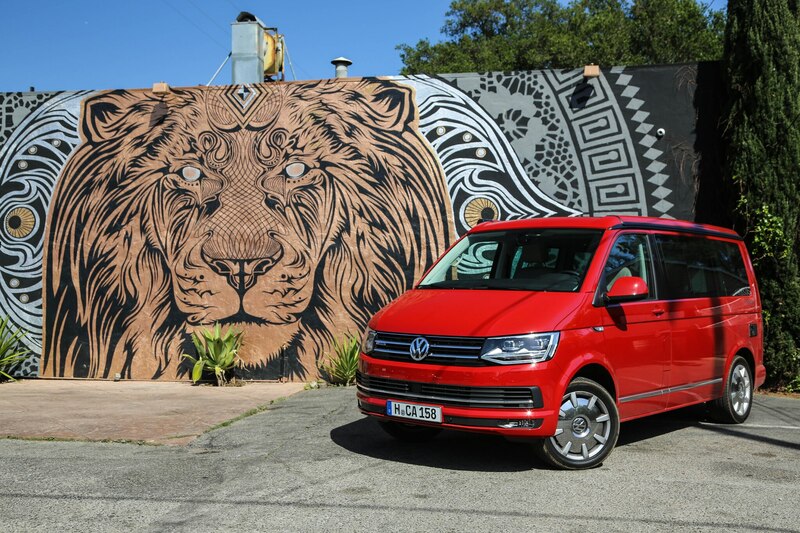 It’s a vehicle whose lineage can be traced back to that of the Type 2—otherwise known as the world-famous Microbus. 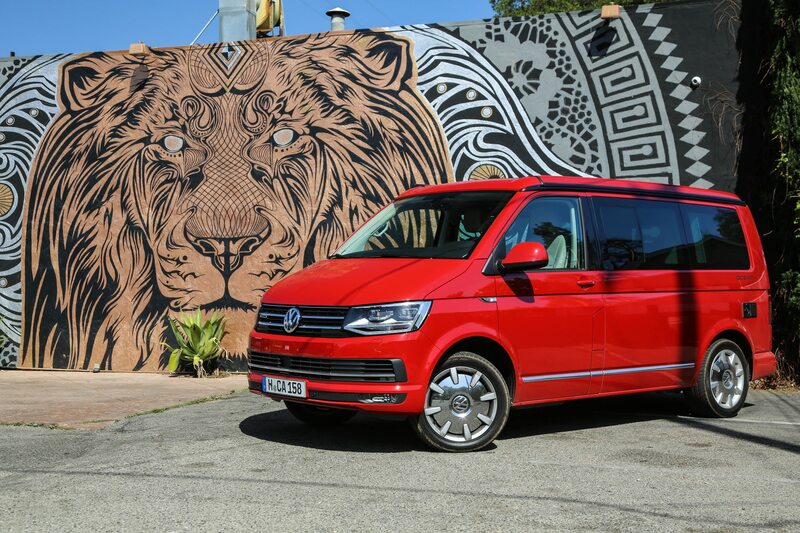 We recently had a go in a version of the T6 called the California, in Southern California of all places (clever, VW, clever). 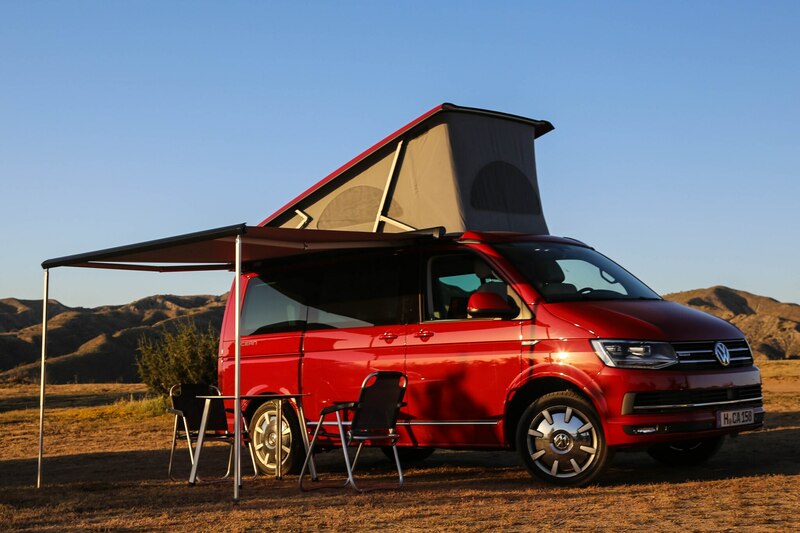 The primary reason Volkswagen shipped a group of brand-spanking new T6 camper vans to the Golden State was to celebrate the 30th anniversary of the California model. 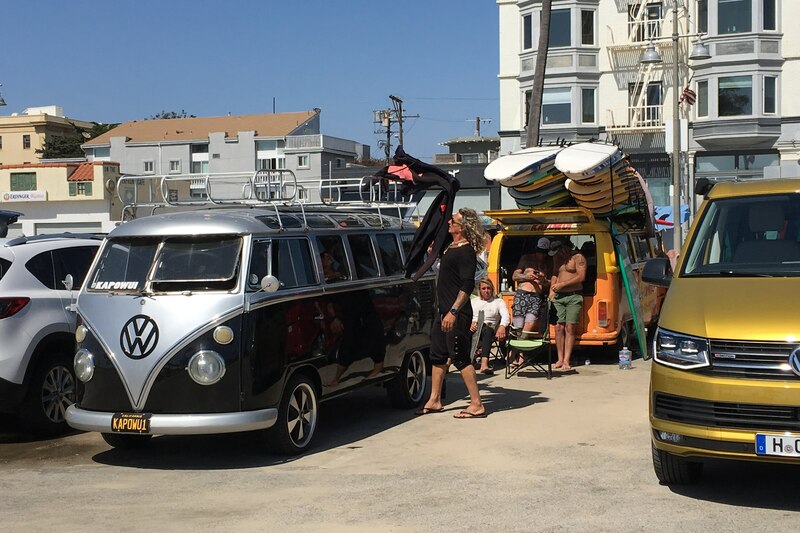 Given that it was taking place in SoCal, VW thought it would be fun to let a bunch of us Americans loose with them for a couple of days. 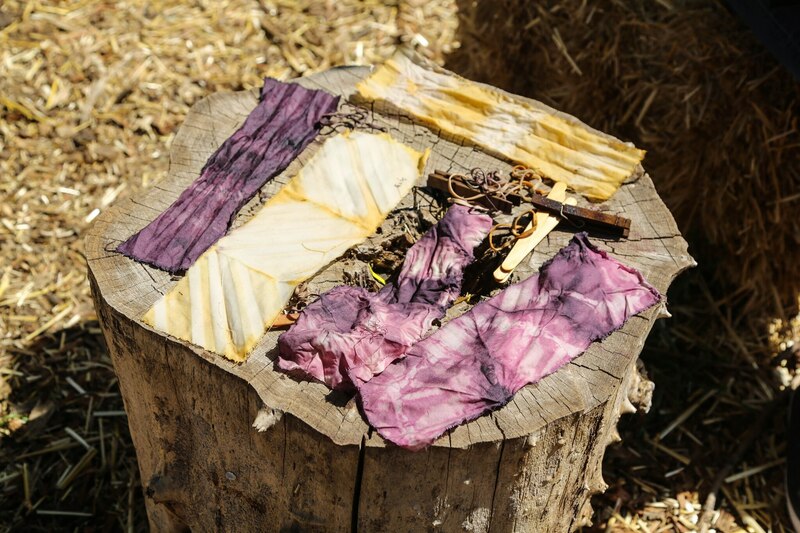 We would quickly come to curse them for letting the rest of the world have them and not us. 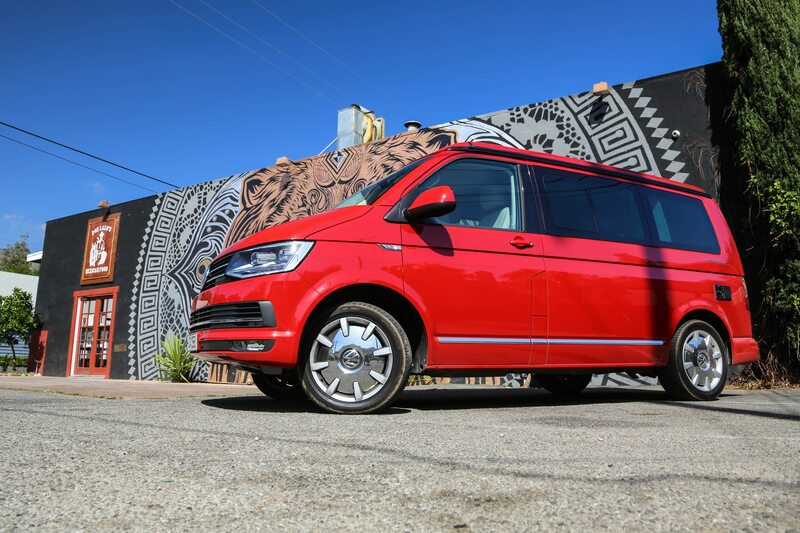 We got a go in an Ocean trim level, the highest spec model in the T6 California hierarchy, save a plethora of special editions. 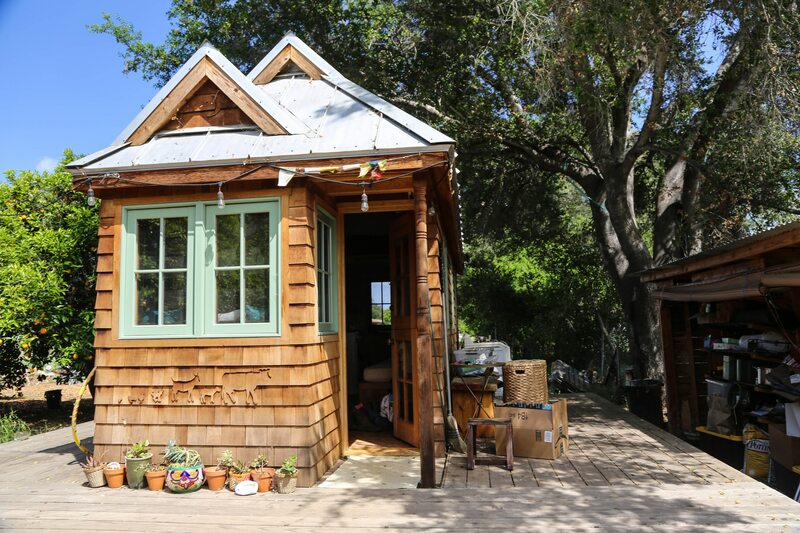 It included a stove, cabinets, drawers, power outlets, lighting, and yes, even a kitchen sink. 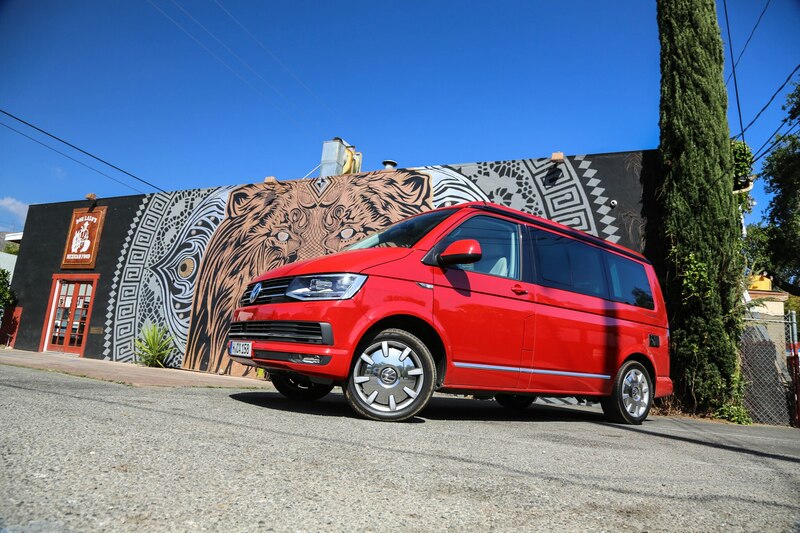 Our particular T6 California was a German-market specification vehicle powered by a version of VW’s long-serving 2.0-liter turbo four driving all 4Motion wheels via a seven-speed dual-clutch transmission. 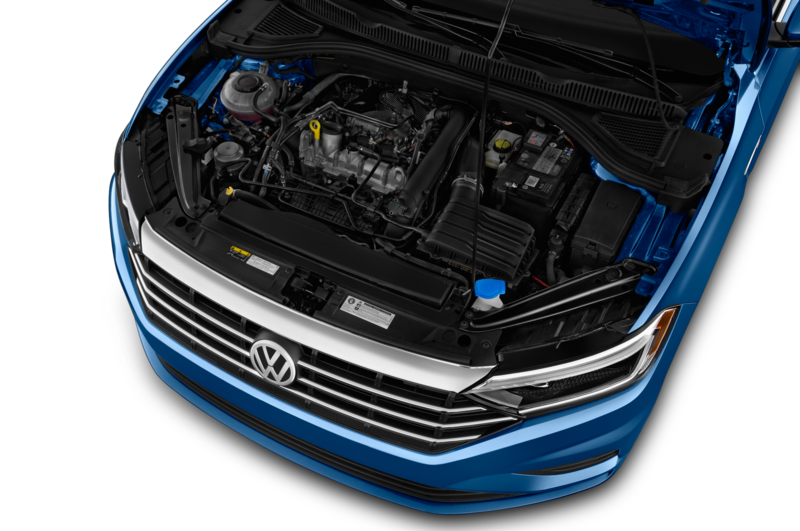 The engine delivers 201 horsepower and 258 lb-ft of torque, potent enough to haul the near-6,000 pound van to 62 mph in a tick less than 10 seconds. 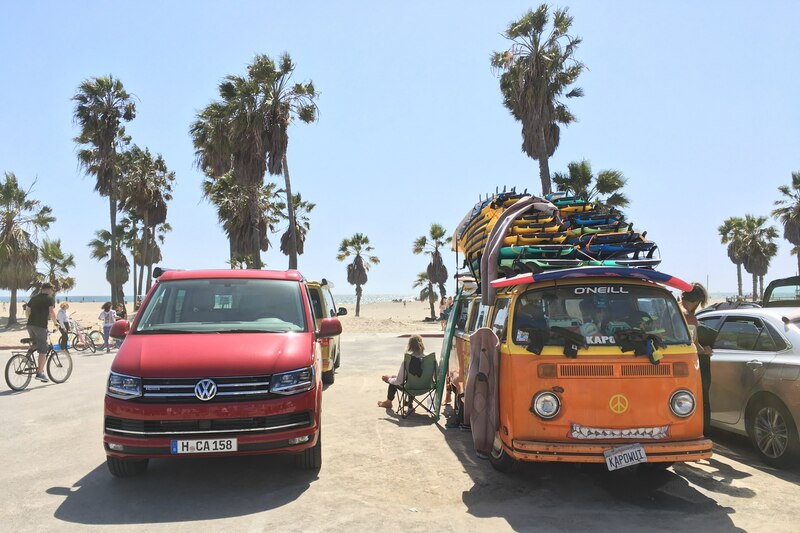 From the pickup location at LAX we slogged our way through some classic L.A. traffic to Venice Beach to meet up with Martin Squires, a surfer who runs a surf school out of his classic VW Microbuses. 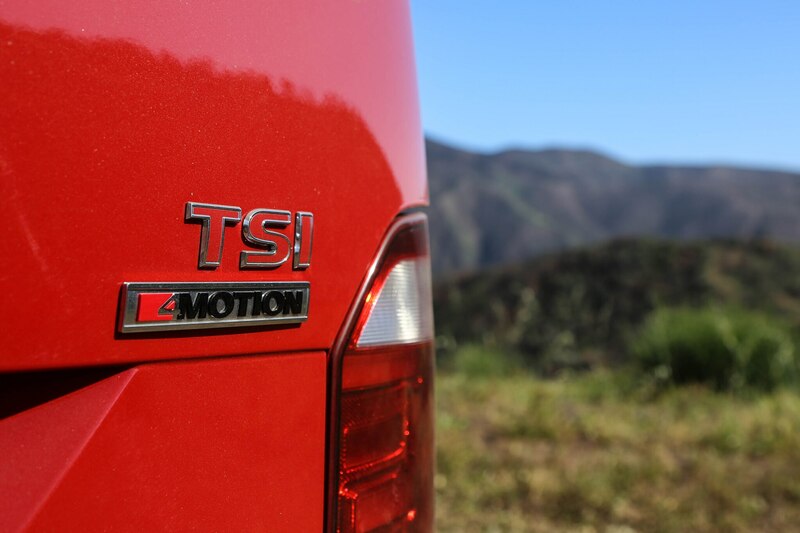 Driving a T6 in this area attracted more looks than a supercar. 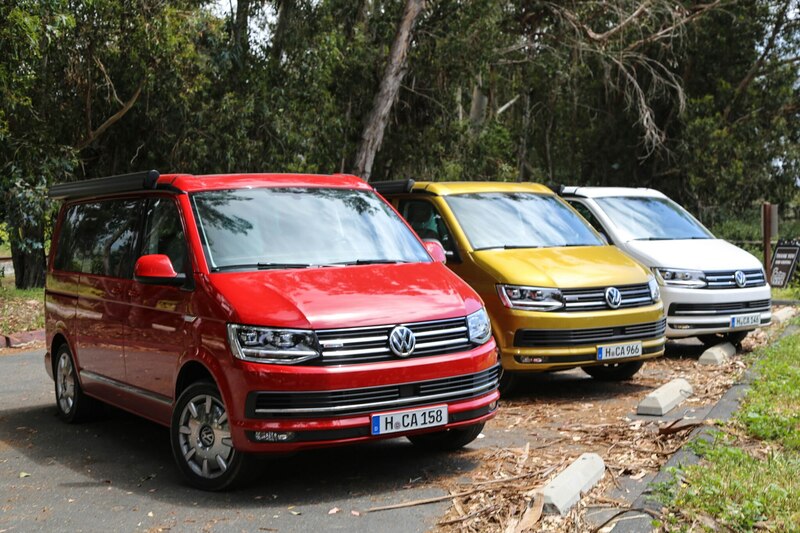 Windows down, an excited onlooker shouted: “Hey when are they bringing those here? 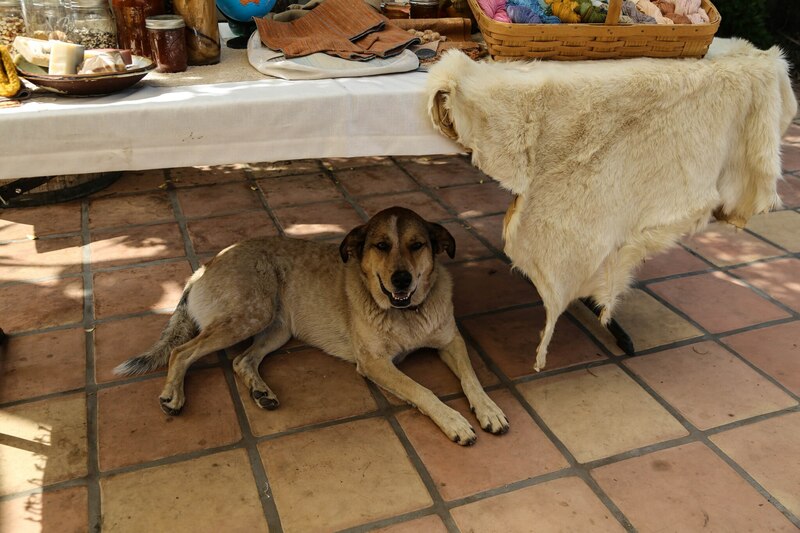 !” Preaching to the choir, bud. 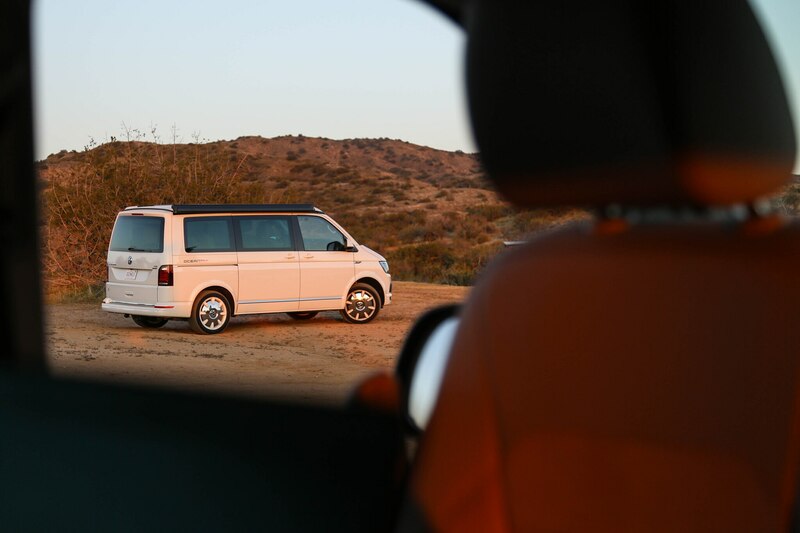 After snapping some shots of Squires’ classics alongside our most up-to-date Transporters, we join the traffic once more for a coastal drive to Malibu, stopping first at a Vintage Grocers store alongside the freeway, where we pick up some coffee and refreshments to stash in the on-board fridge. 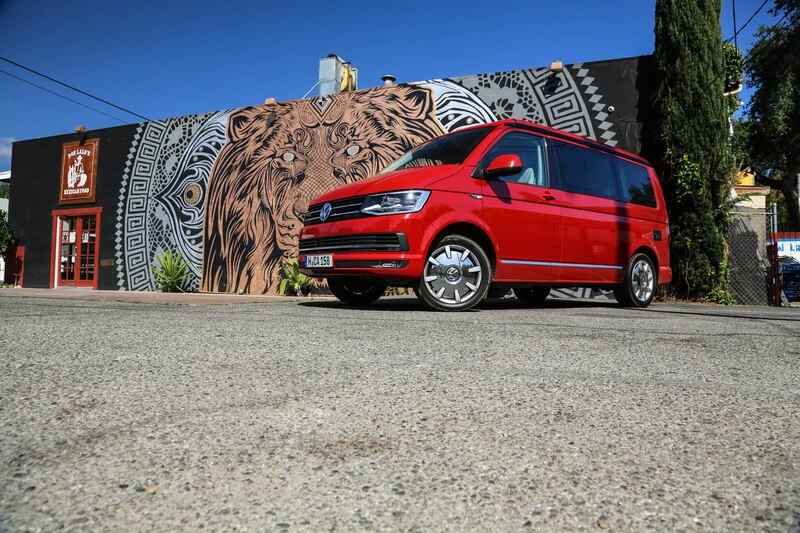 On the way back to the van, a pair of local boys—already stoked out of their minds to get a glimpse of our T6 Ocean-liner—almost have a stroke when we give them a tour. 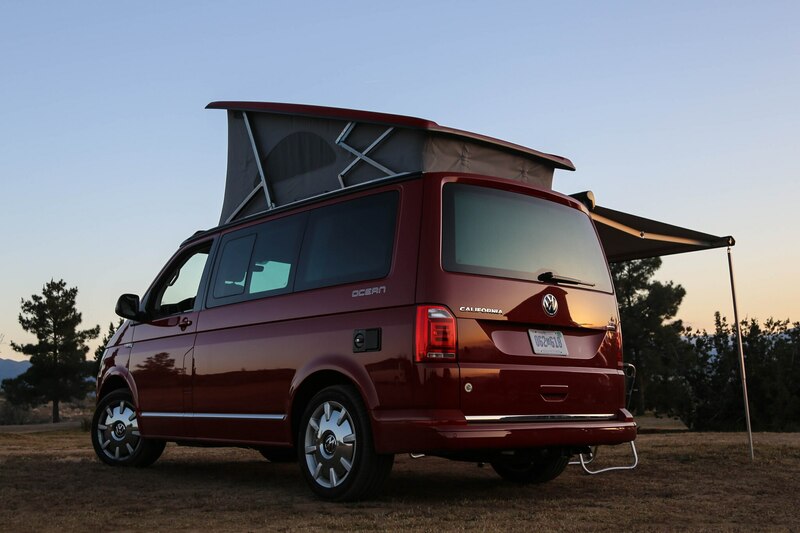 These campers are an extrovert’s dream. 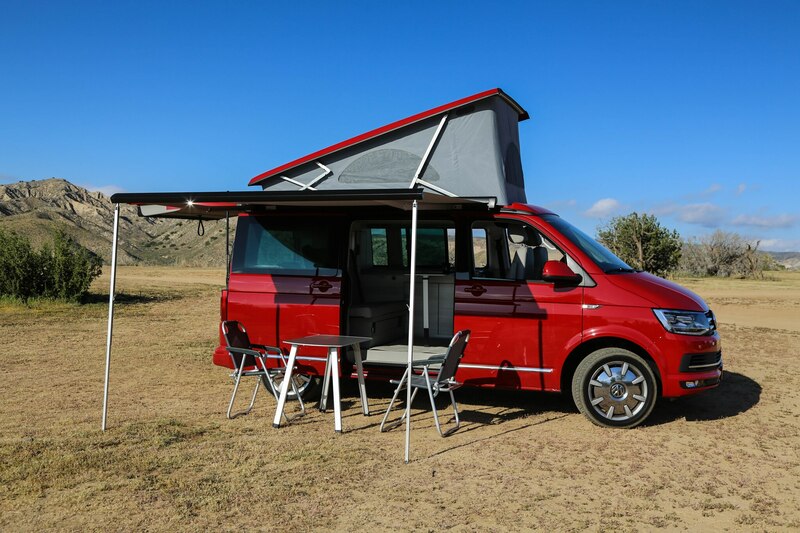 During the final stretch of the first day’s drive, we work our way up the coast to a camping spot in Carpenteria, just south of Santa Barbara. 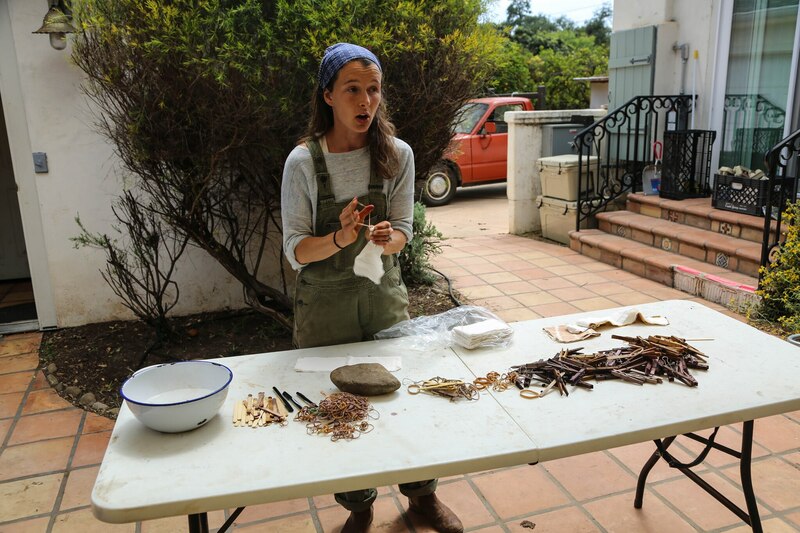 From the ocean-adjacent site on a hillside, our hosts give us a walkthrough of our homes for the night. 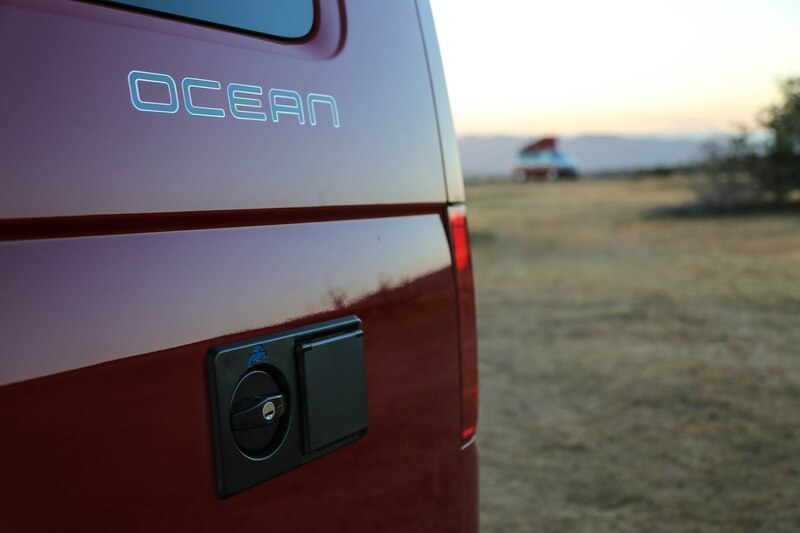 After showing us around the kitchen, we learn about some of the other cool kit equipped on our California Ocean campers. 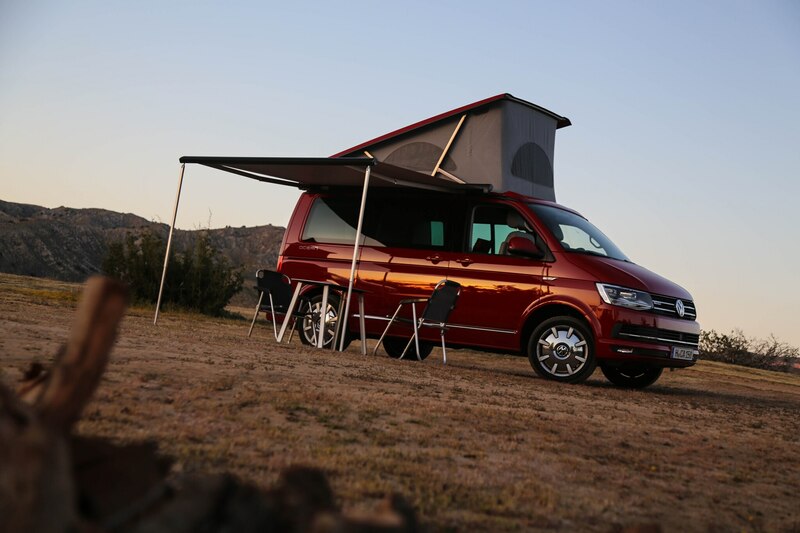 The California’s signature pop-up top tent feature is electronically operated from the control unit over the driver and front passenger seats. 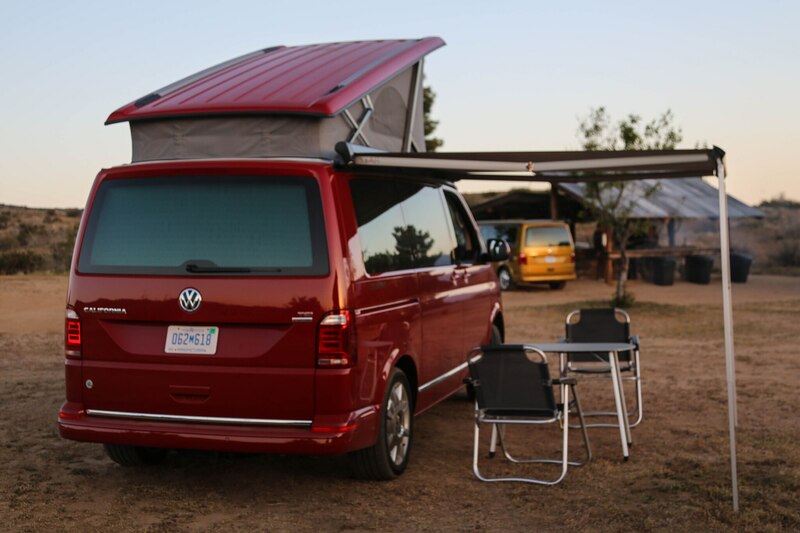 Once the tent is up, the upper level can be raised and lowered to allow adults to stand on the bottom floor. 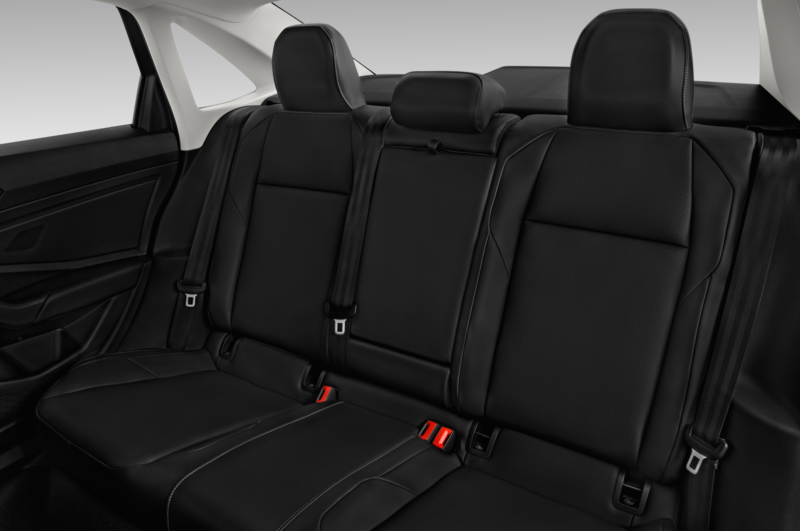 The rear seats flip down to make a second bed. 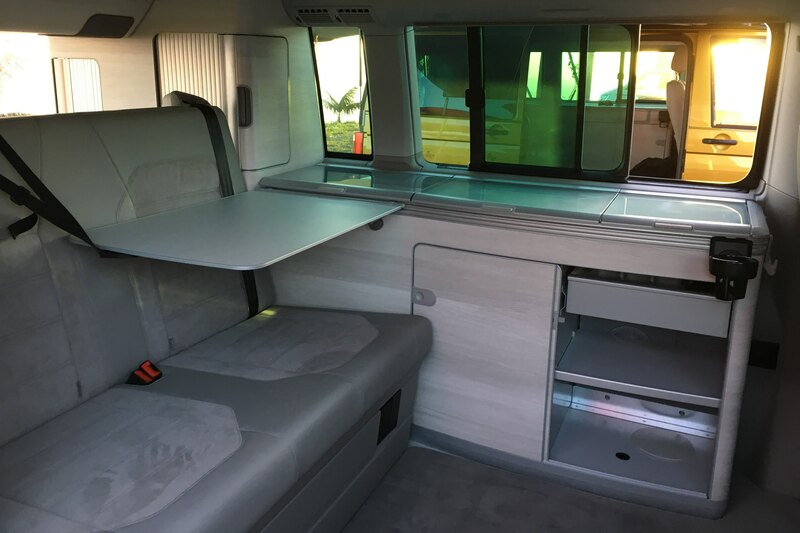 There’s a folding table inside the van, and the front two seats swivel around to allow four people to sit around the surface. 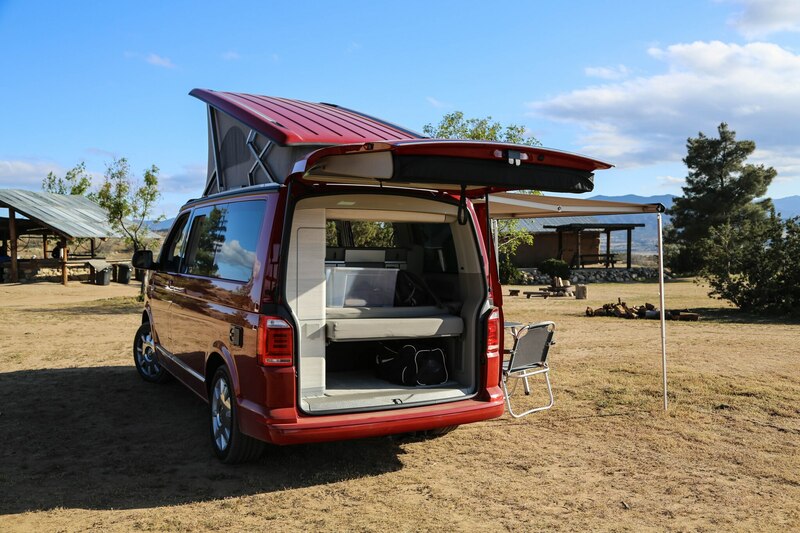 Other hidden furniture includes folding chairs stashed in compartments in the rear hatch, and a camping table stowed inside the sliding door. 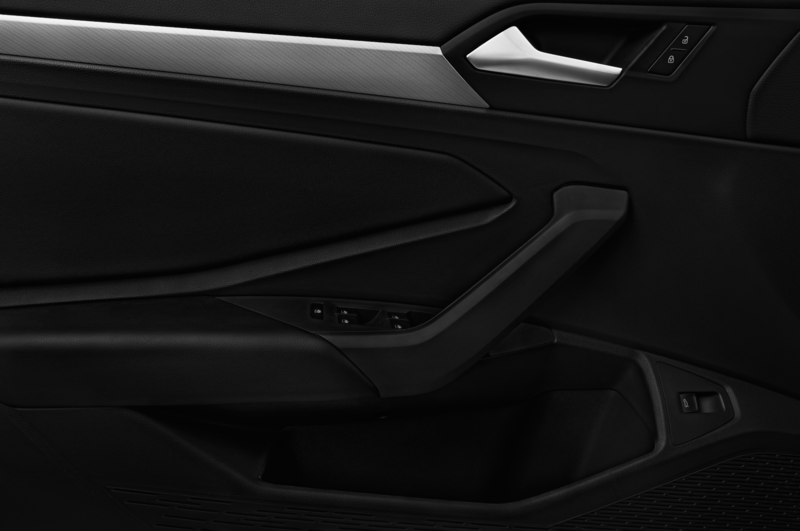 Hidden among the door frames are shades that allow for complete privacy. 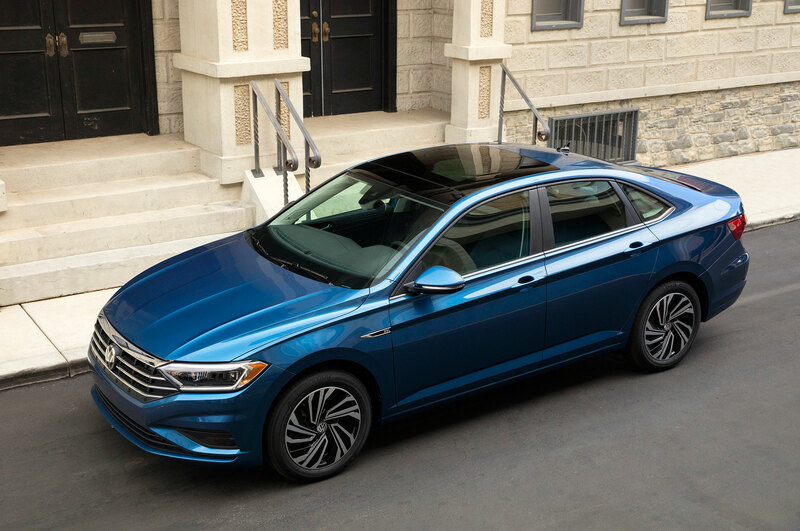 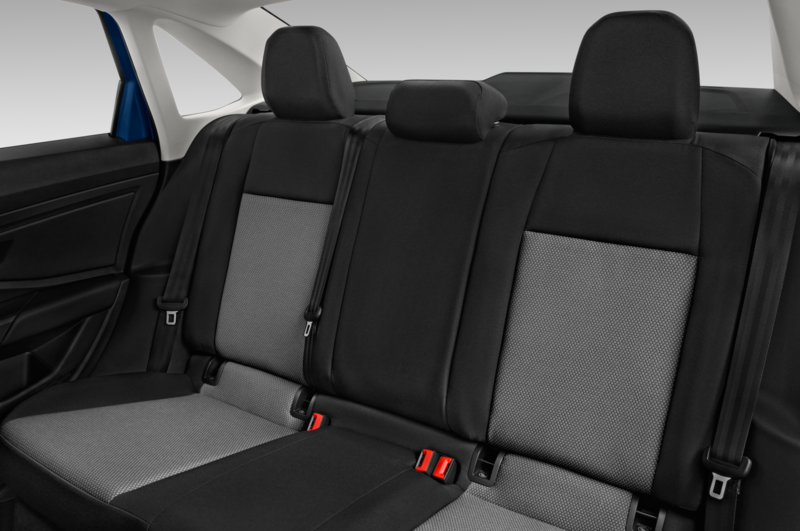 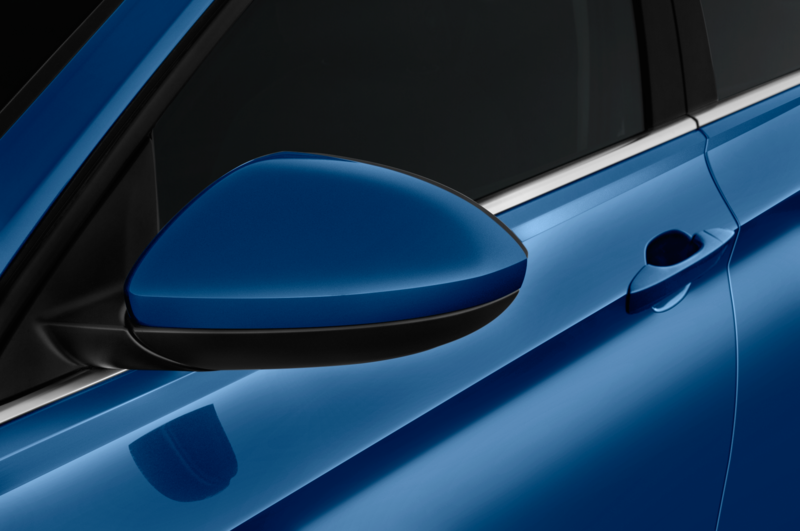 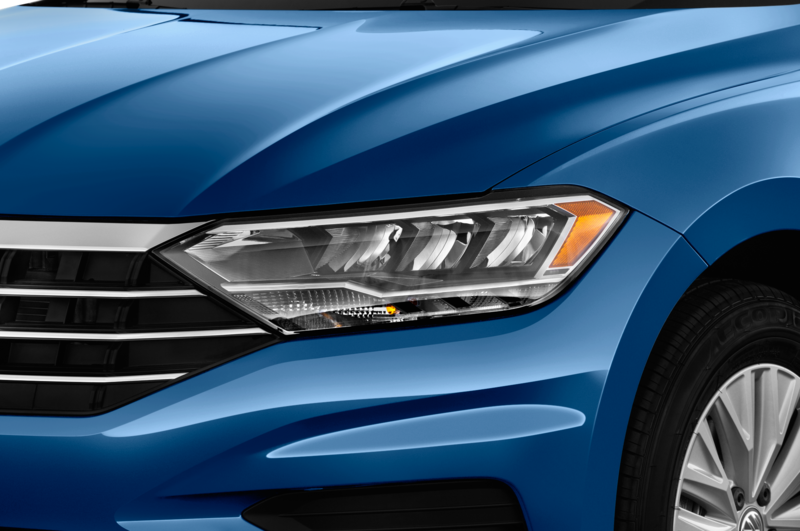 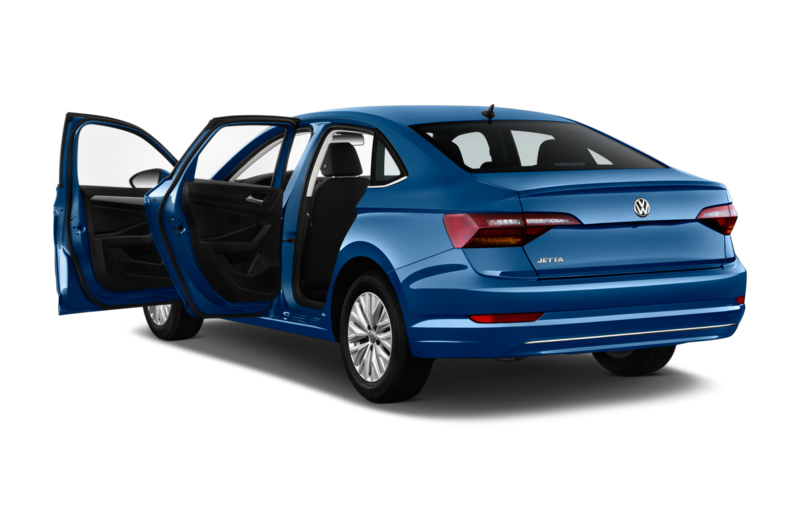 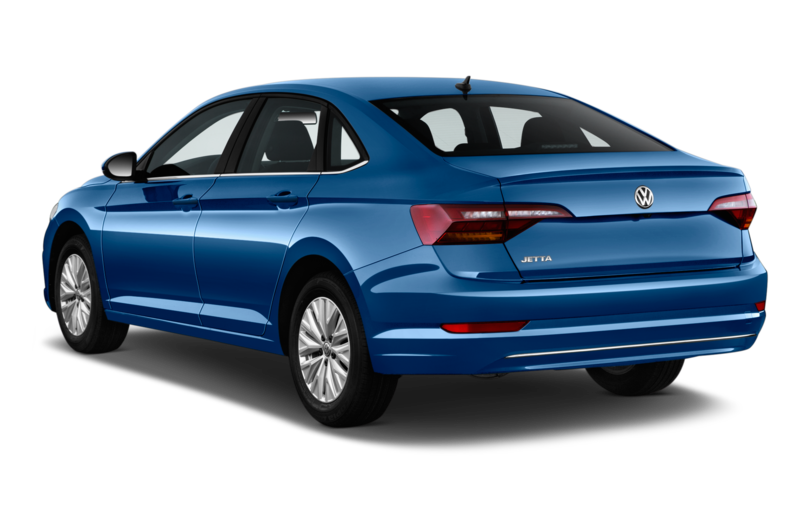 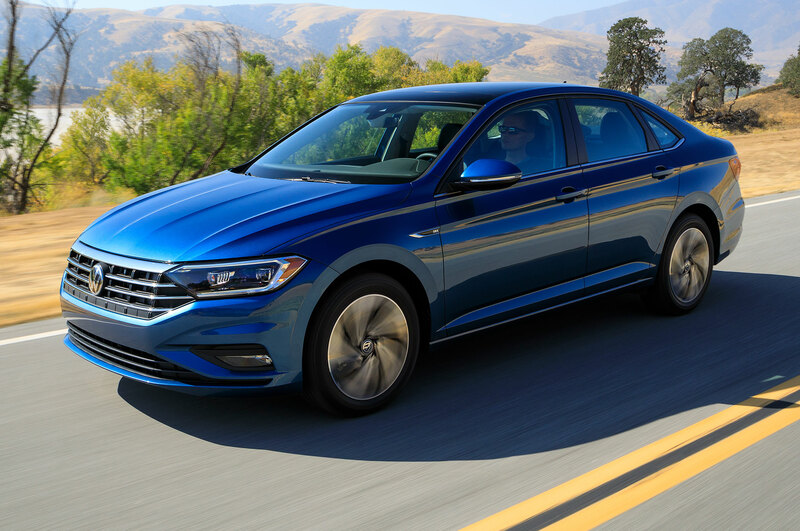 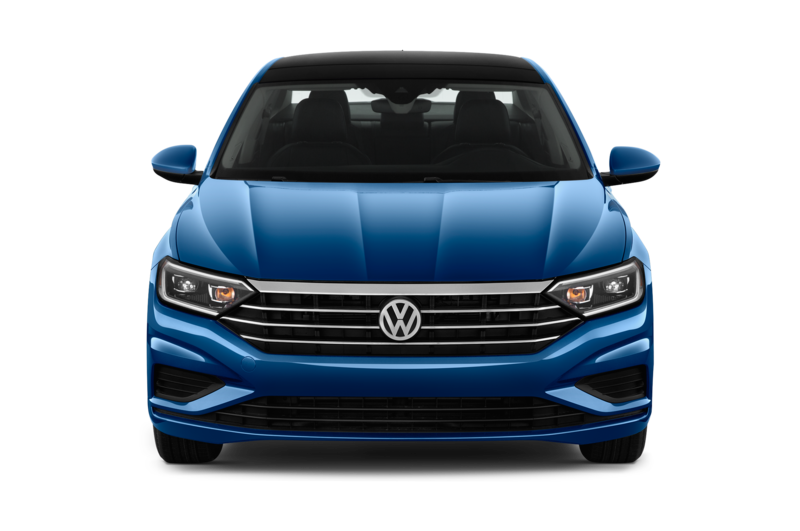 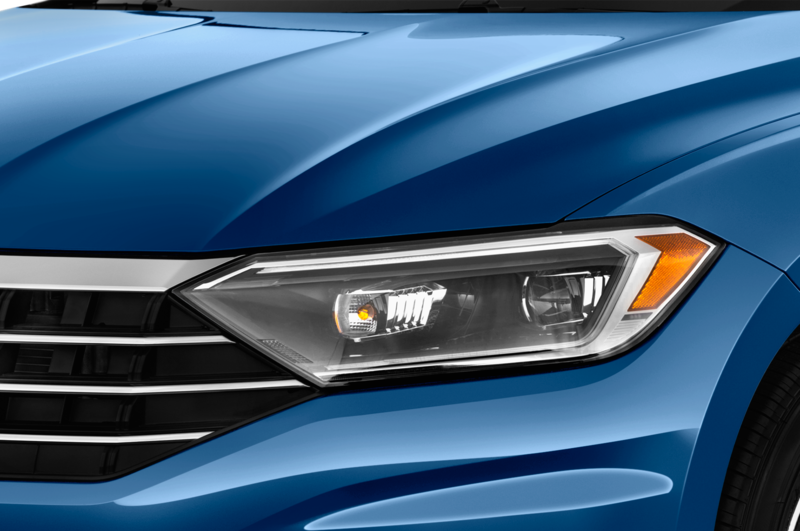 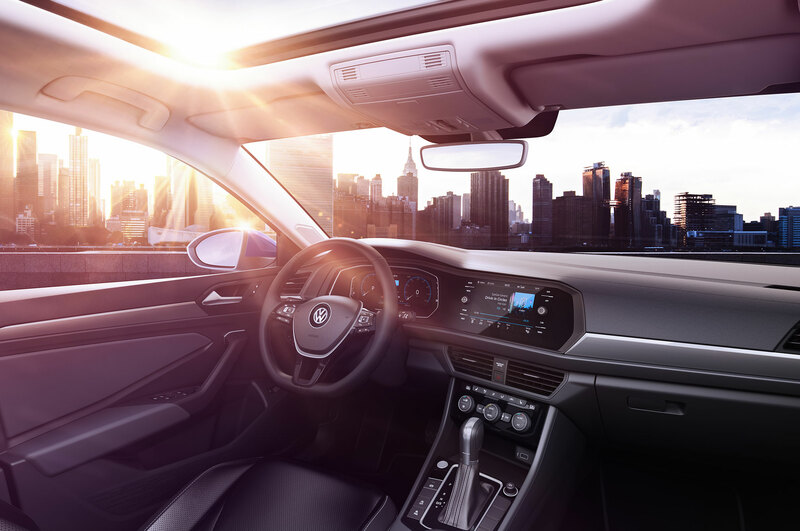 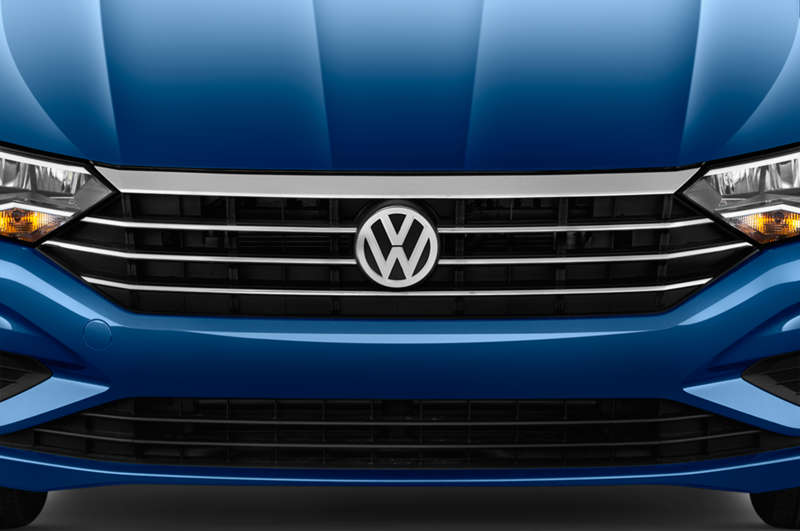 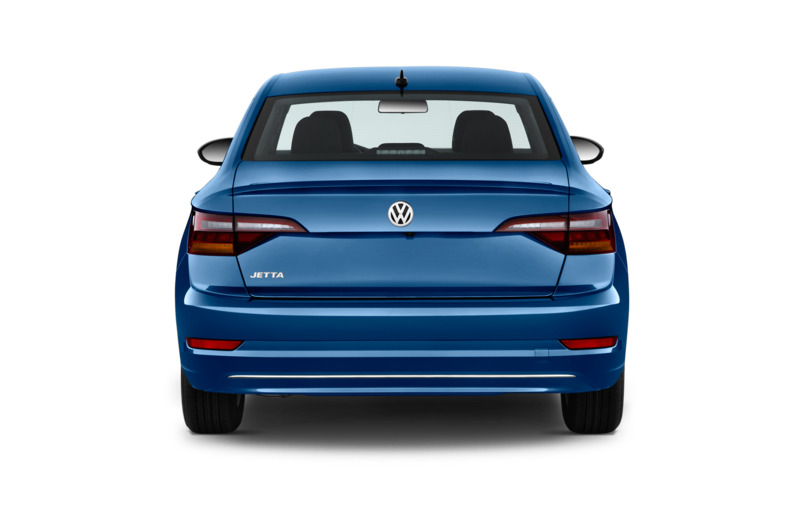 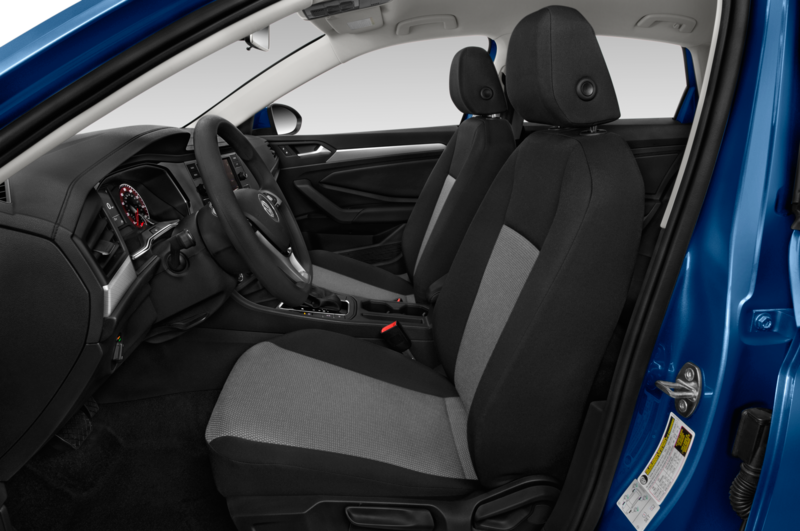 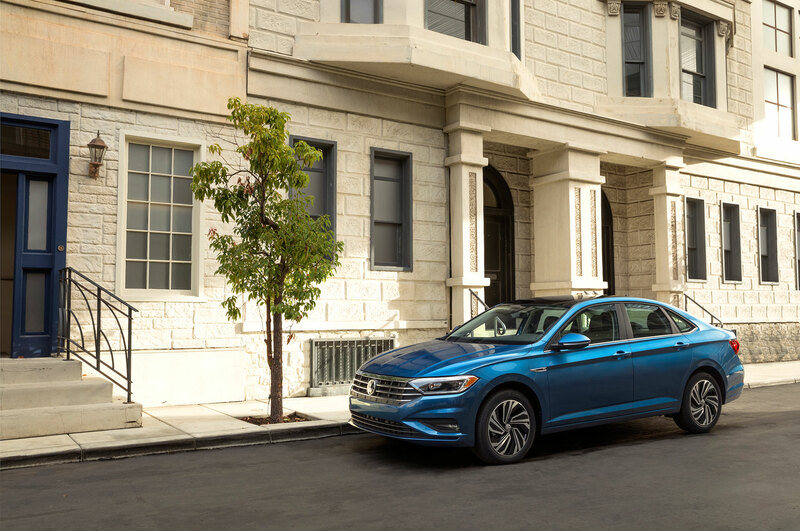 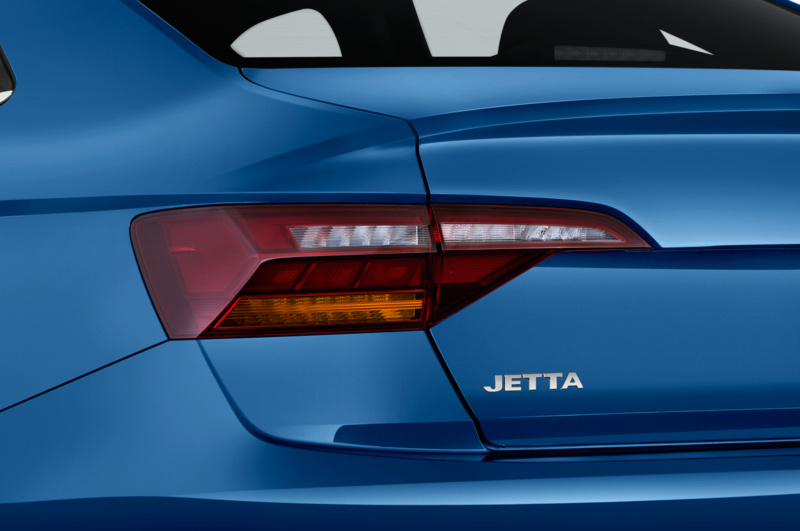 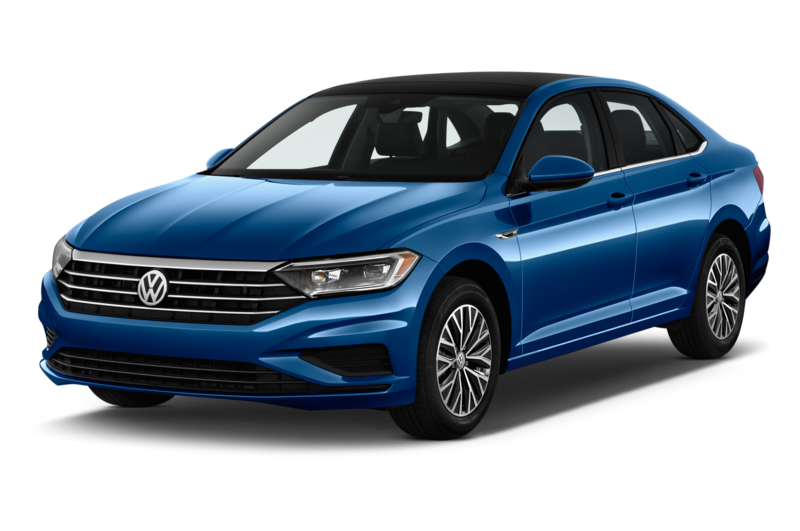 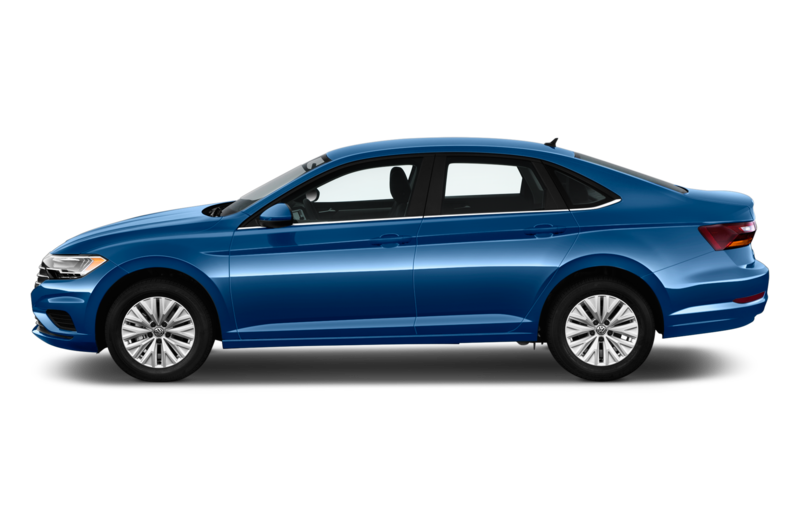 The driver and passenger windows don’t get hidden shades, but Volkswagen includes cloth window covers that stick to the steel door frames to conceal the forward cabin. 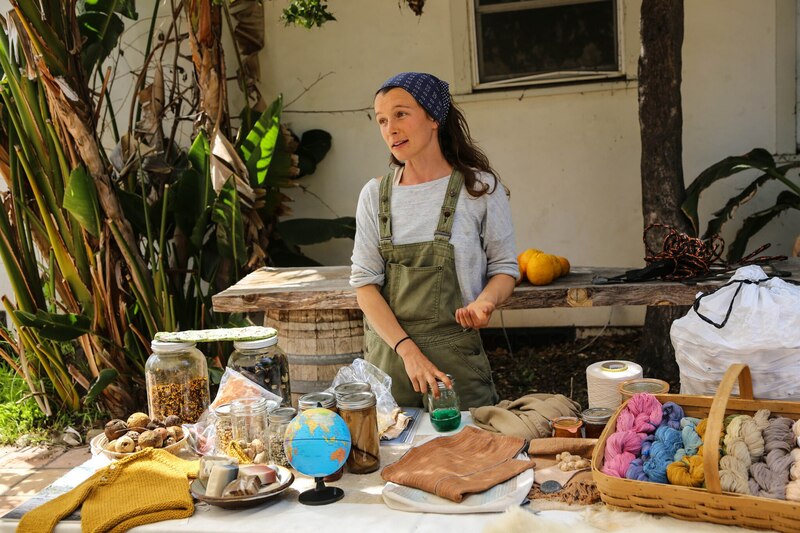 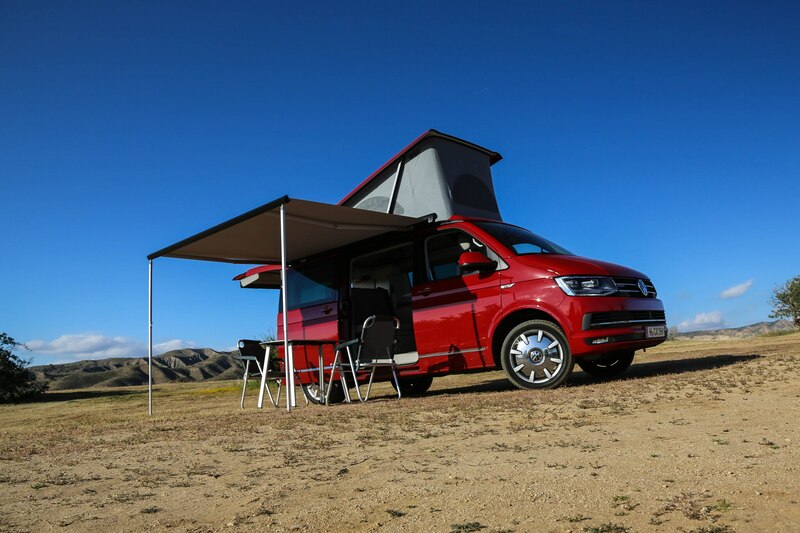 Once the feature walkthrough is complete (our VW hosts also point out the 30-gallon tank for onboard water storage, waste water receptacle, and gas tank to heat the stove), our crew enjoys a seafood dinner and a warm campfire. 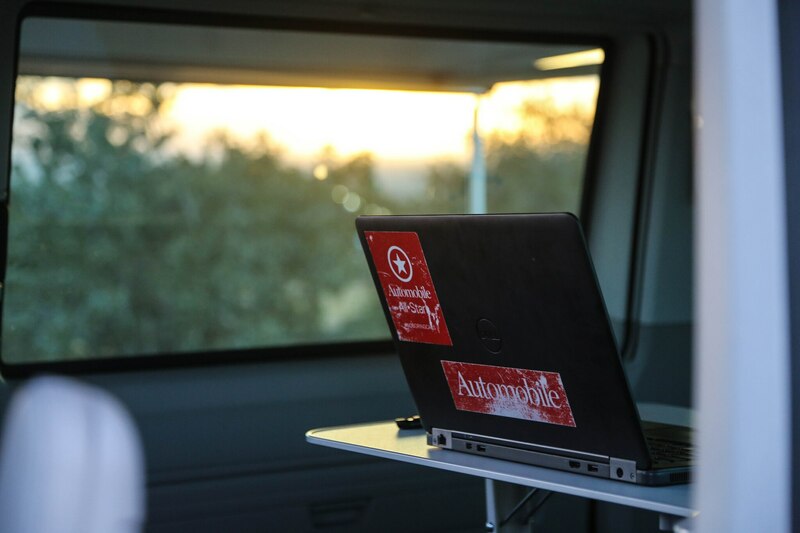 We use the foldout chairs from our vans and chat until it’s time to retreat to our vans. 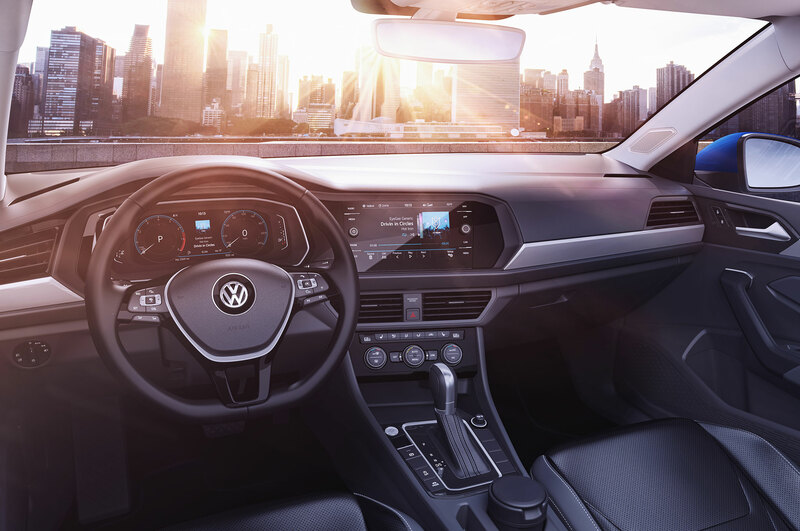 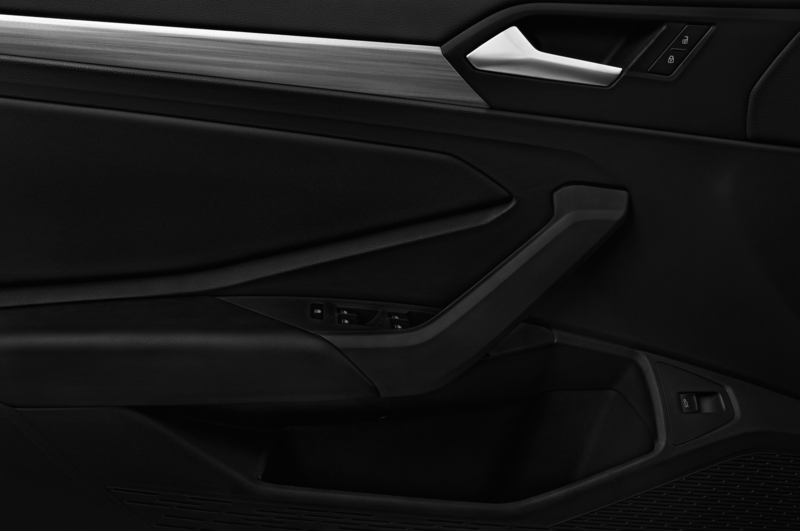 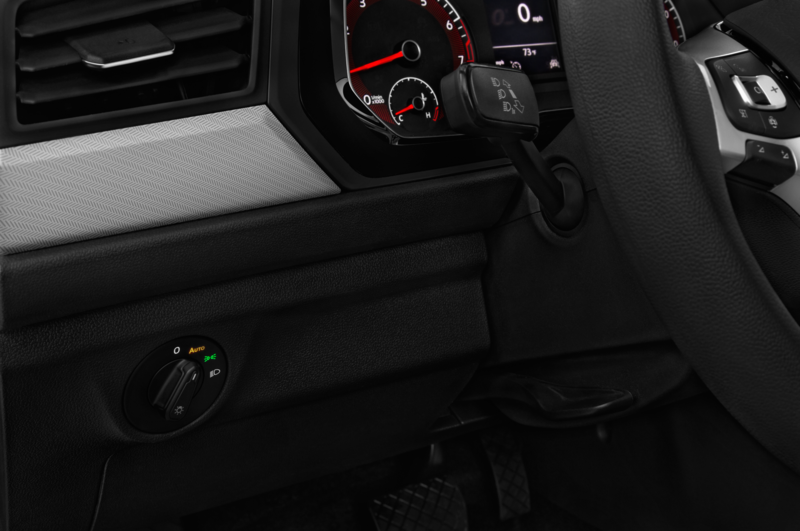 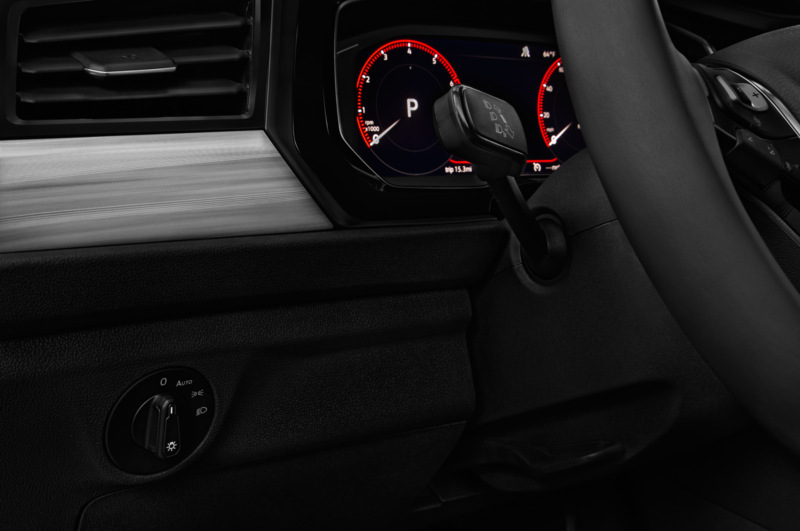 Once inside, we use the full suite of LED lighting and the onboard heater while enjoying some music using the Android Auto and Apple CarPlay compatible infotainment system. 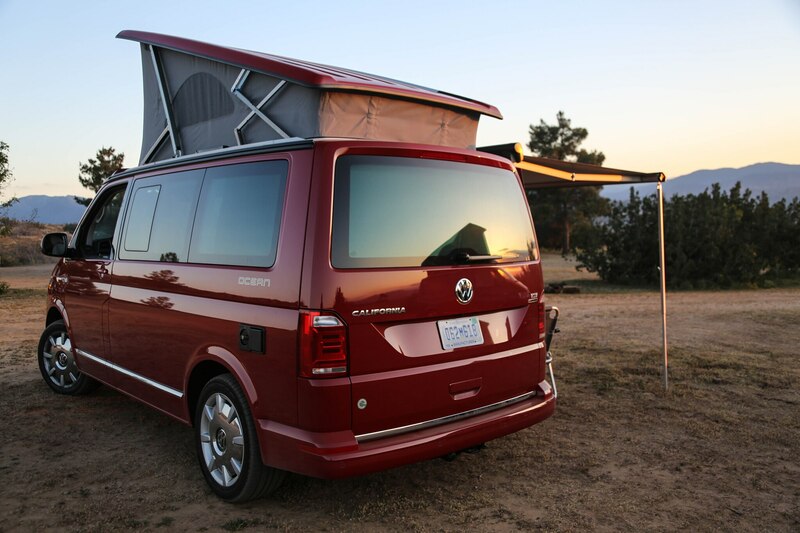 I personally bunk on the upper-level bed, which has a wooden slat support underneath. 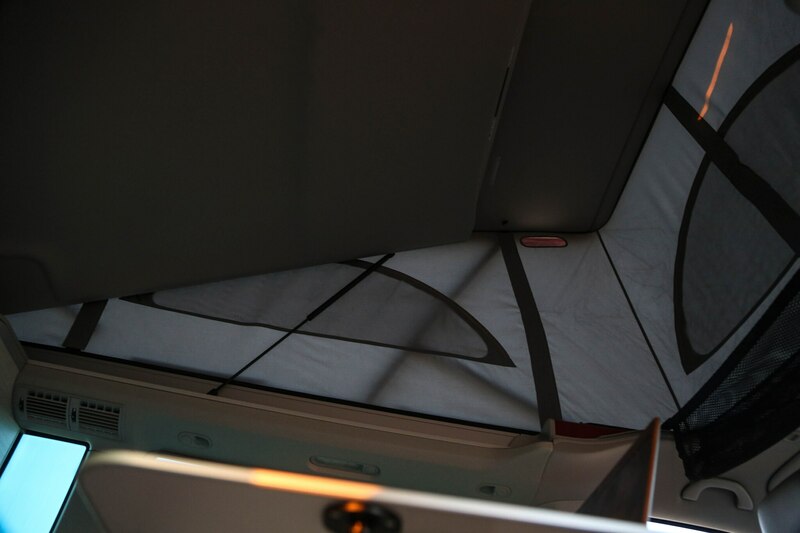 The thick cloth walls of the tent are wind resistant and ventilated, which kept me warm and protected for the duration of the night. 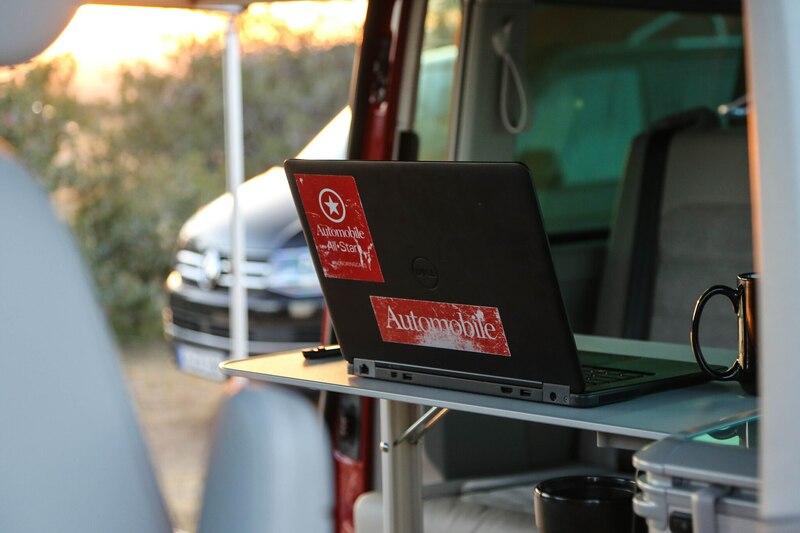 The following morning we have breakfast at the camp and then break down the camper’s setup in preparation for the day’s journey. 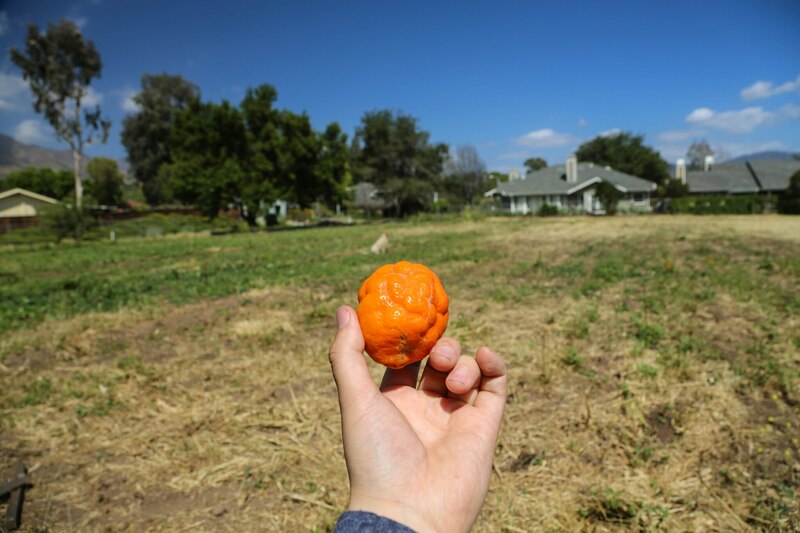 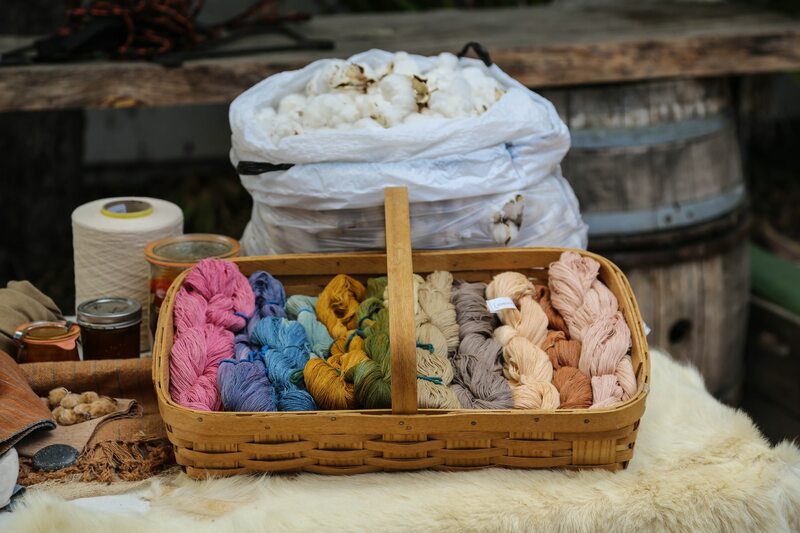 Our next leg is a quick jaunt to Ojai, a free-spirited town inland from Santa Barbara. 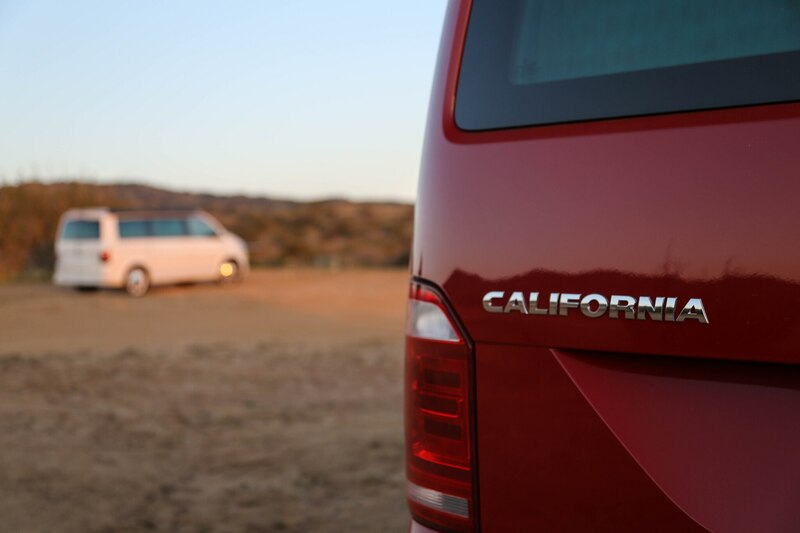 Along the way, we hustle the Californias along some of the area’s winding roads. 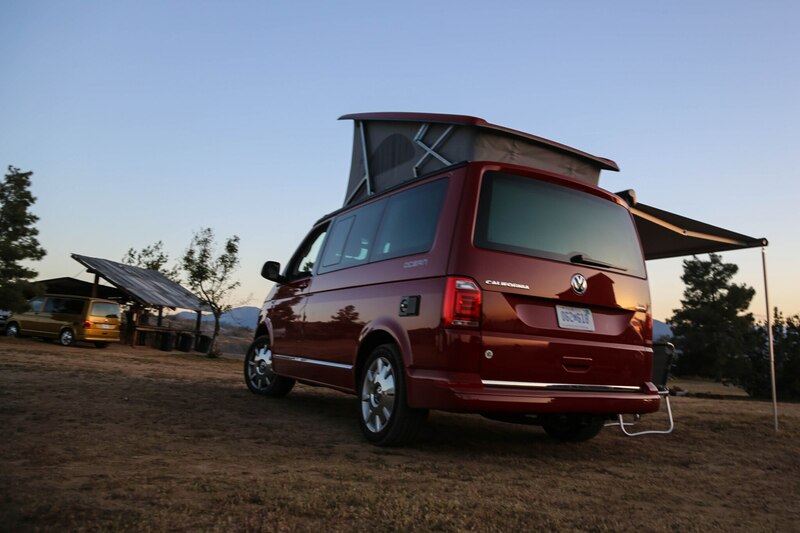 For what amounts to a rolling bed and breakfast, the T6 handled the twists and turns remarkably well. 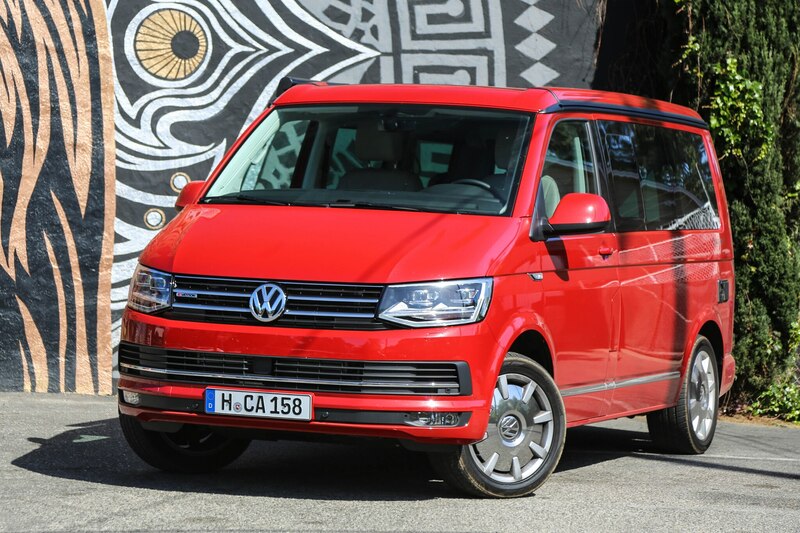 Thanks in part to its optional adaptive chassis control system we tackled several aggressive corners with something actually approaching confidence. 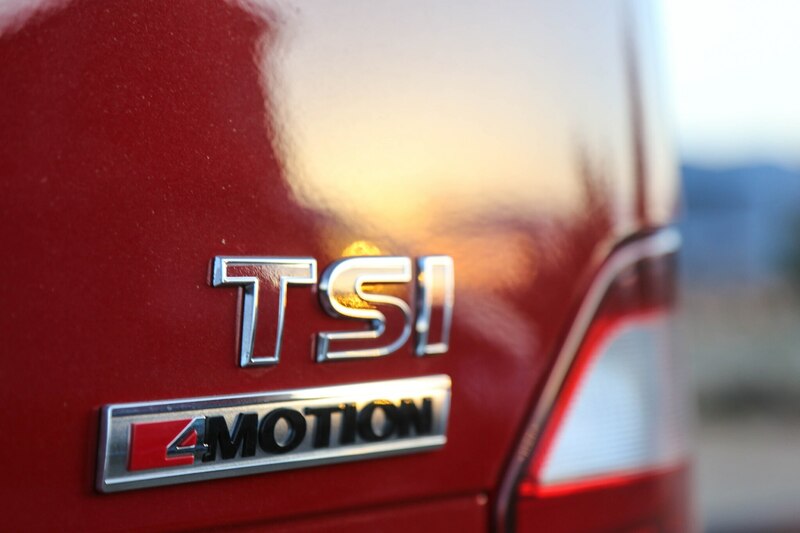 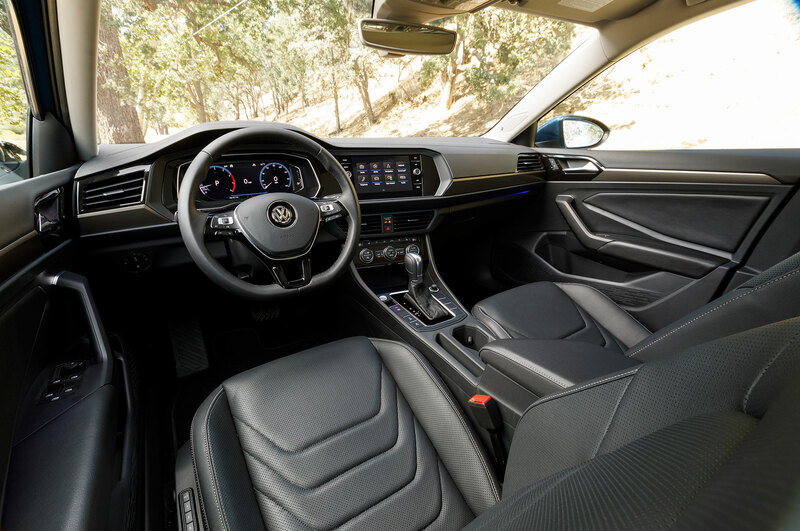 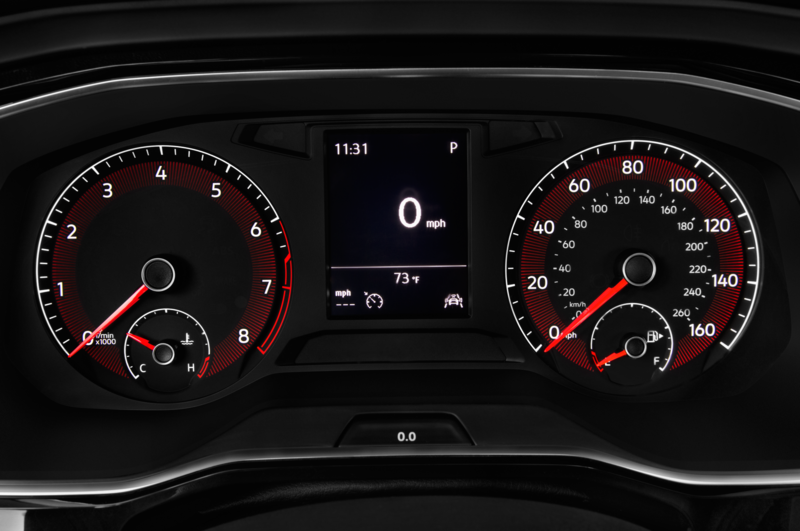 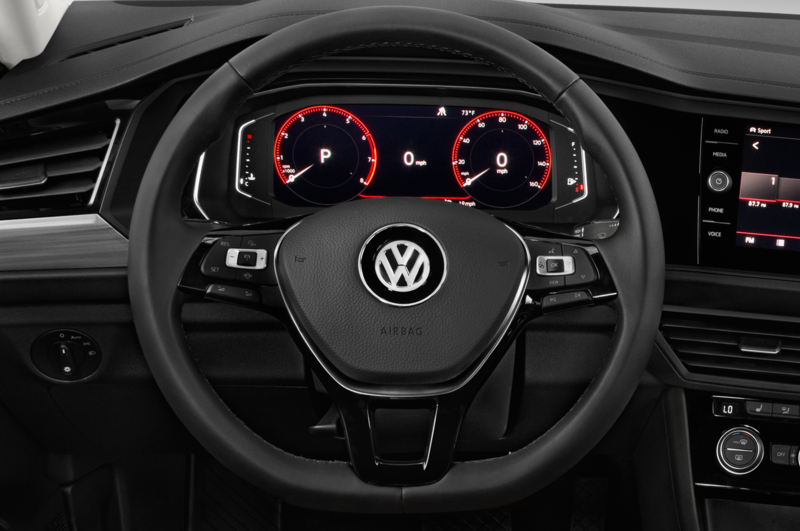 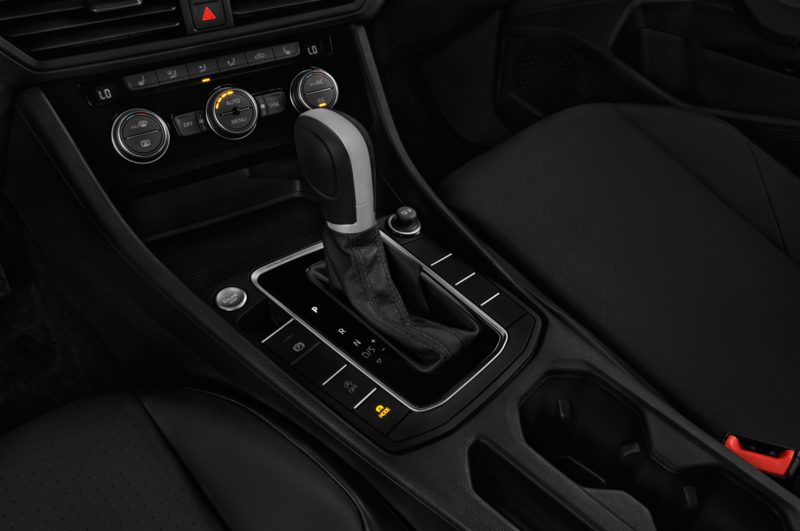 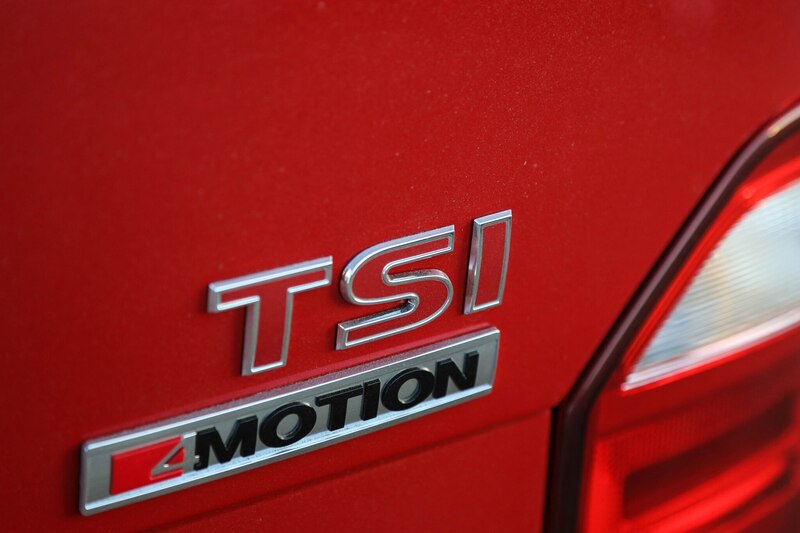 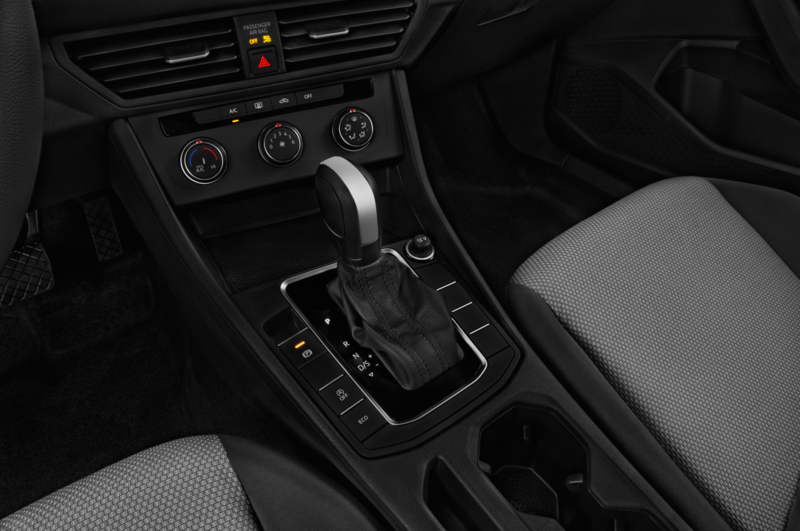 The T6’s steering proved direct and very tactile, its powertrain accelerates smoothly, and the steering wheel-mounted paddle shifters work great for picking the right gear on inclines or declines. 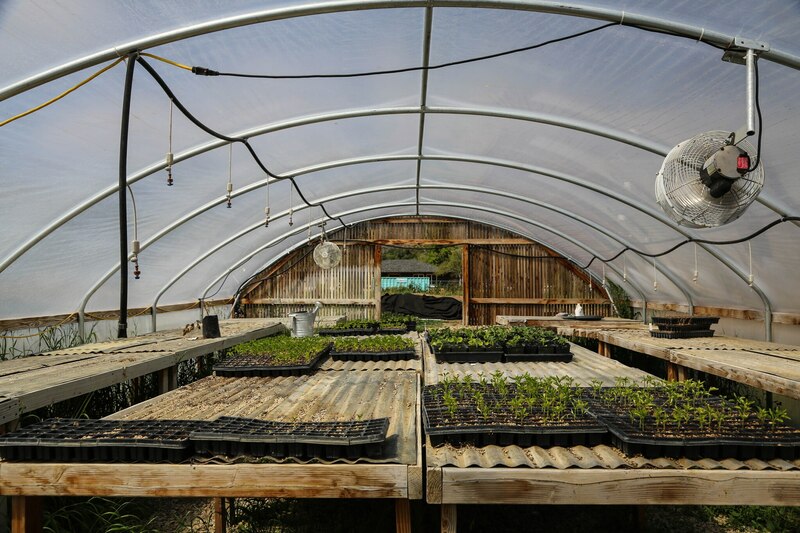 After a hearty vegetarian meal for lunch, we take in some local color with a visit to Poco Farm. 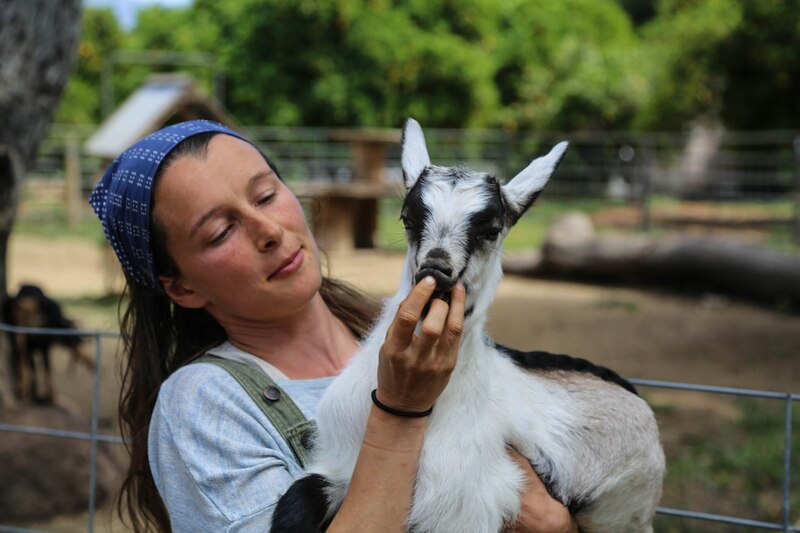 The fields and orchards are located in the town, and farmer Grace Malloy explains how her operation varies drastically from most other farms in the U.S. because of its small size and sustainability practices. 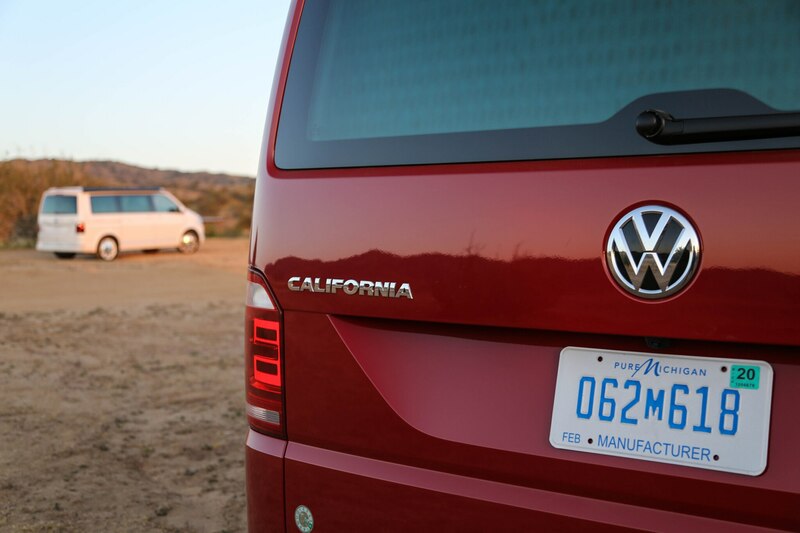 Following a final photo shoot in Ojai, we head out to the Songdog ranch in Maricopa for another night of camping. 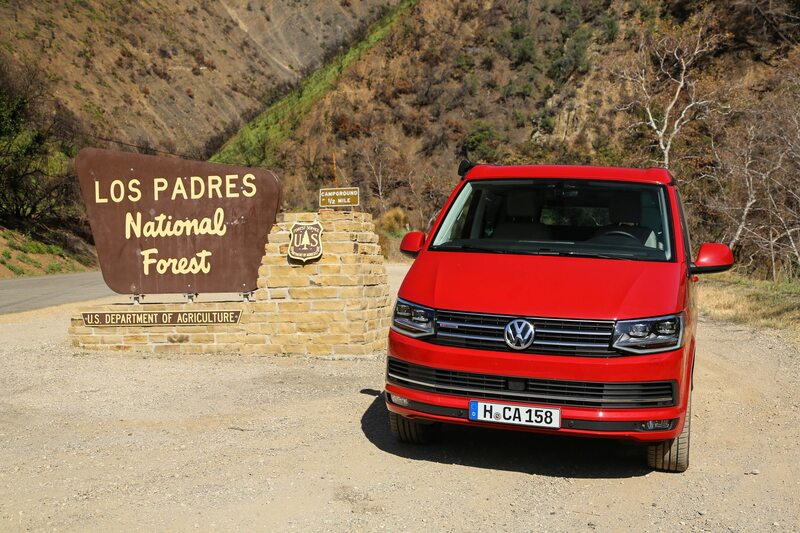 It turns out to be a breathtaking drive, not just for its sweeping vistas but also because it cuts through land torched by California’s recent devastating wildfires. 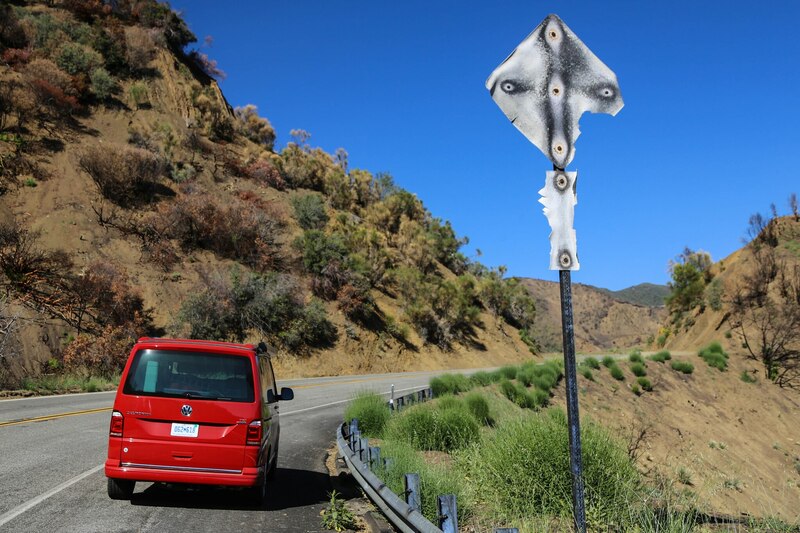 The scorched trees, homes, and road signs along the way serve as a reminder of the ferocity of nature and how it can impact our lives, as well as the importance of getting out there and experiencing the things the world has to offer. 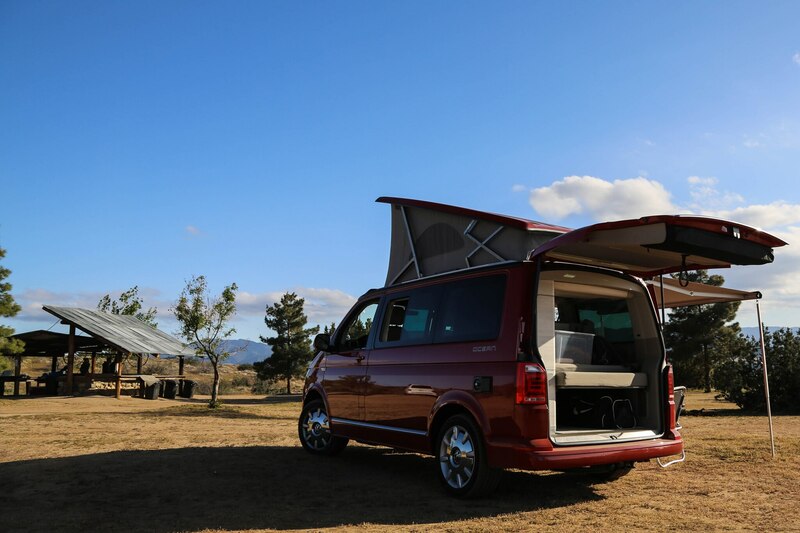 Our camp is in the high desert and the wind rips through our campsite, causing the tiny windmill on the roof of the adobe-walled ranch to spin feverishly. 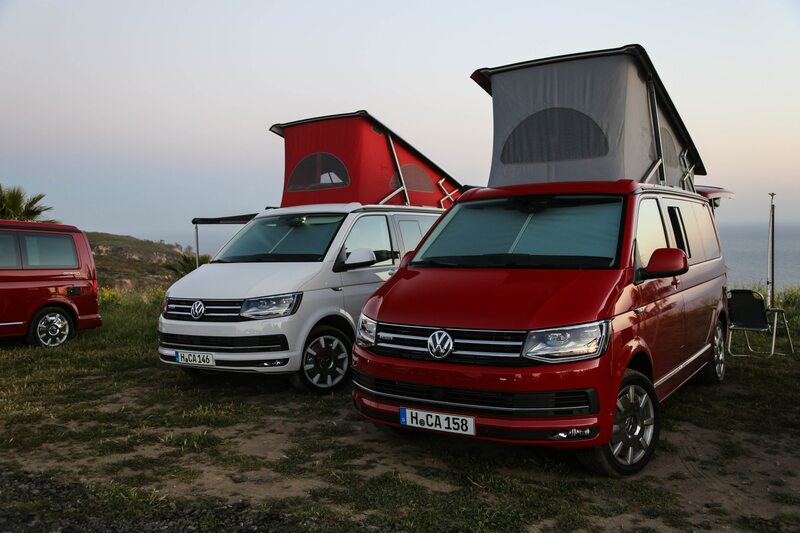 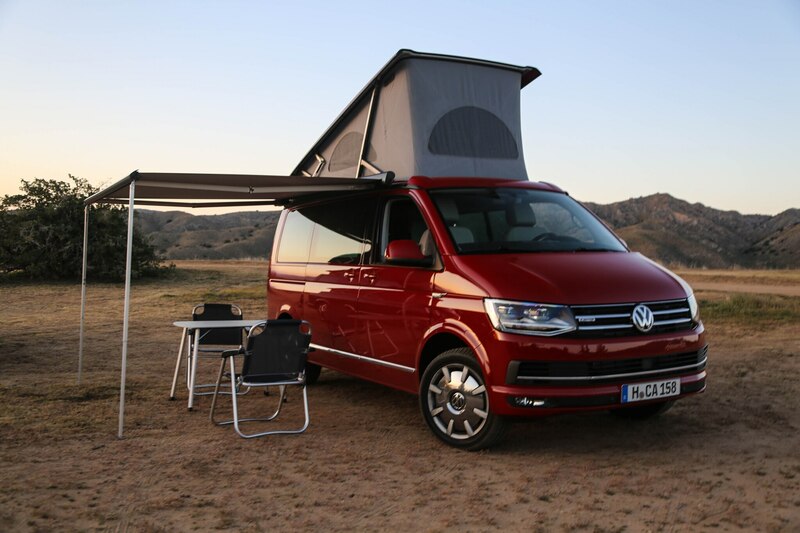 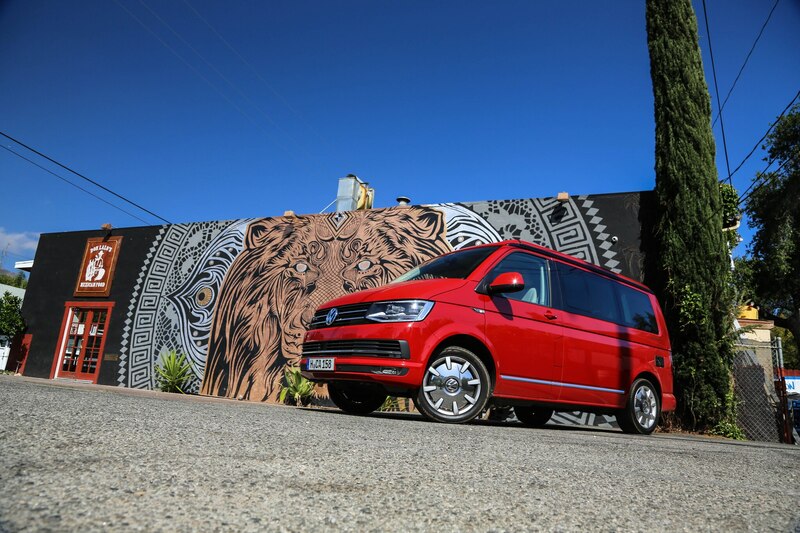 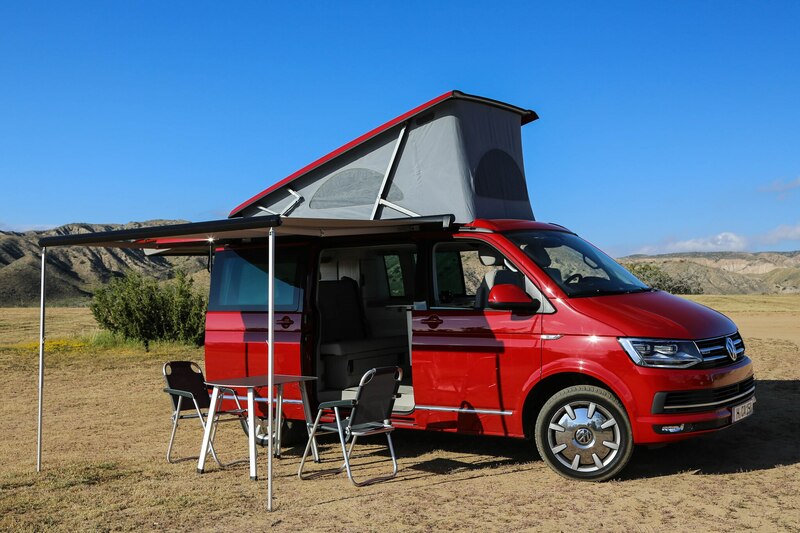 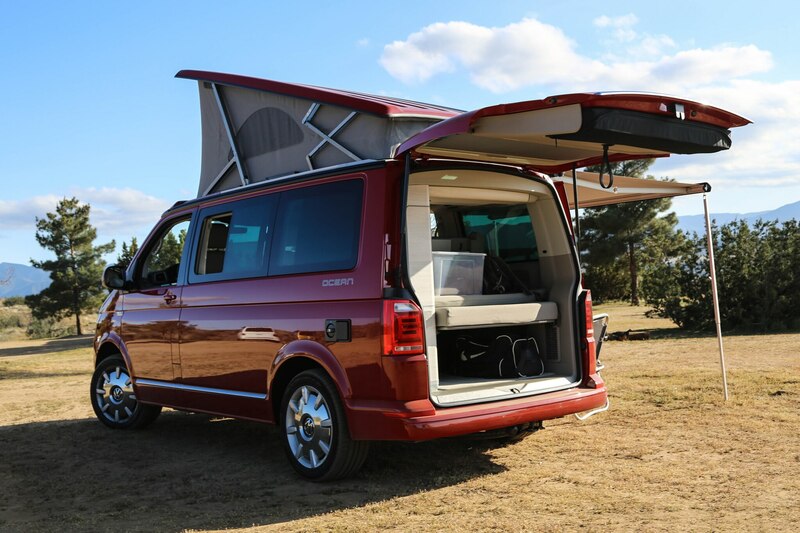 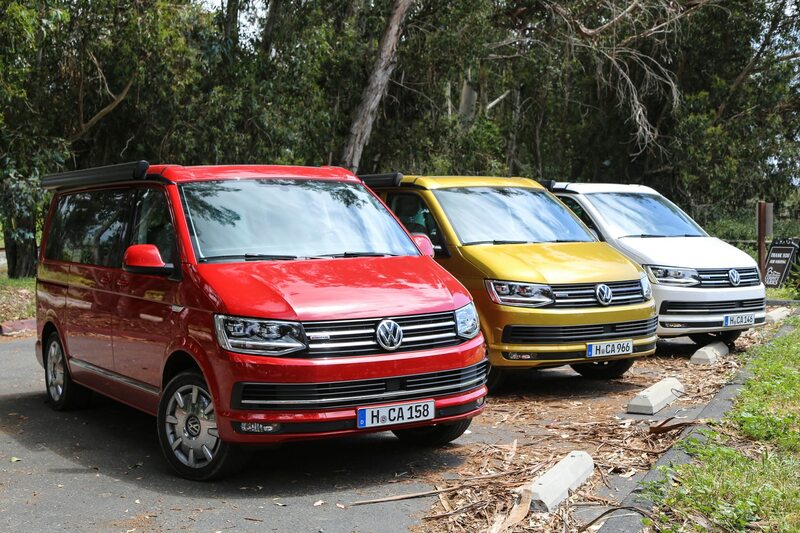 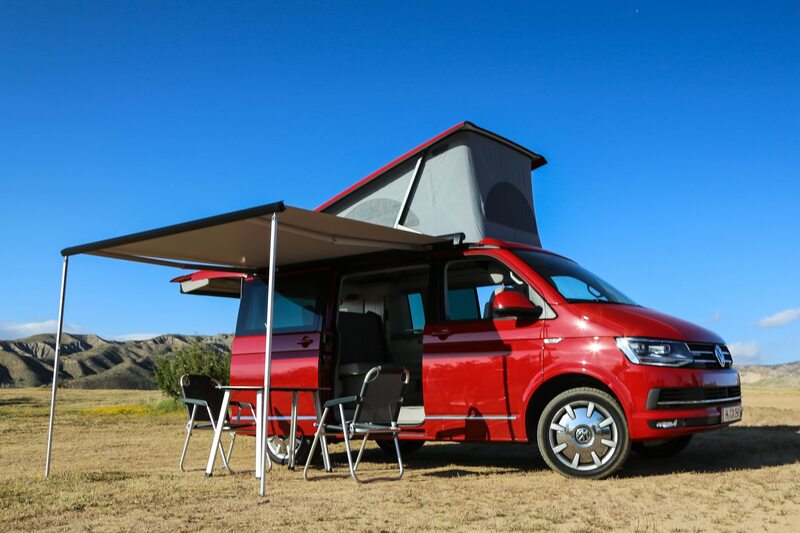 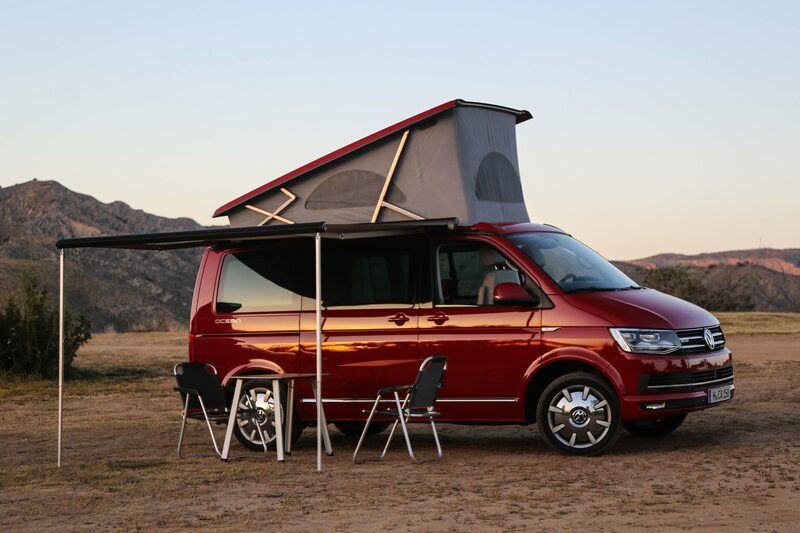 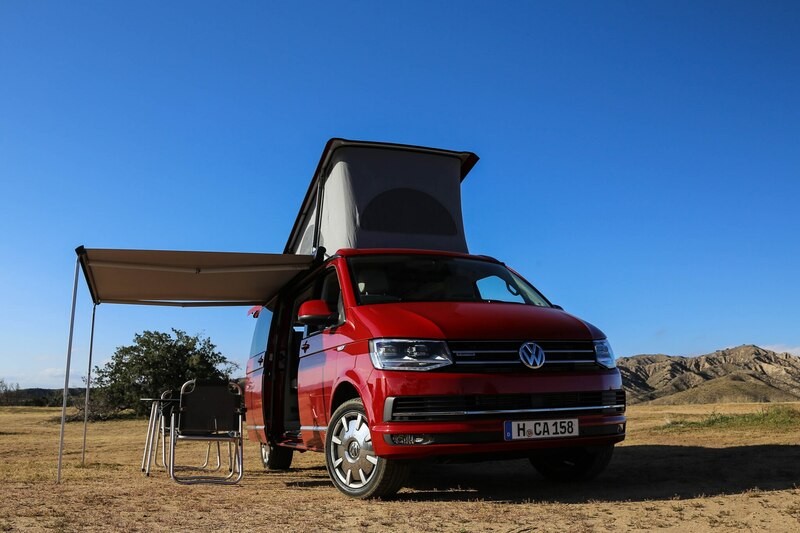 We set up the exterior-mounted awning, another feature that serves as one of the biggest points of contrast between the T6 California and Volkswagen’s other Transporter variants. 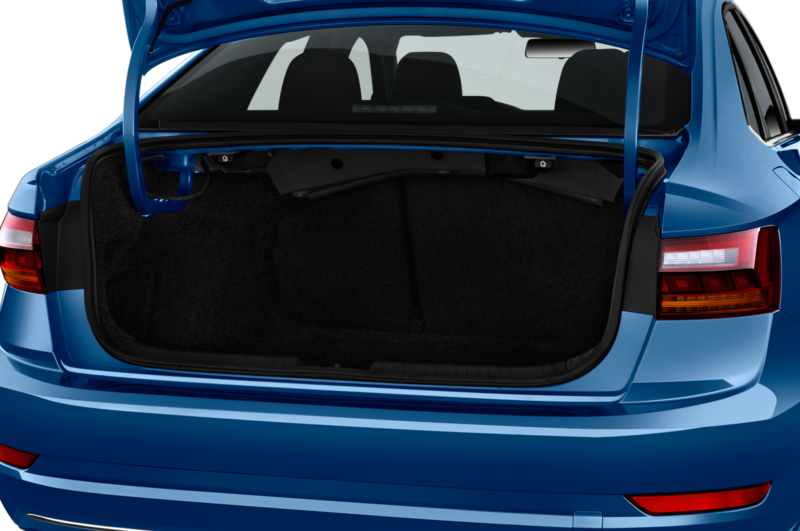 A crank, cleverly stowed in one of the drawers hidden under the passenger seats, is used to unwind the canopy. 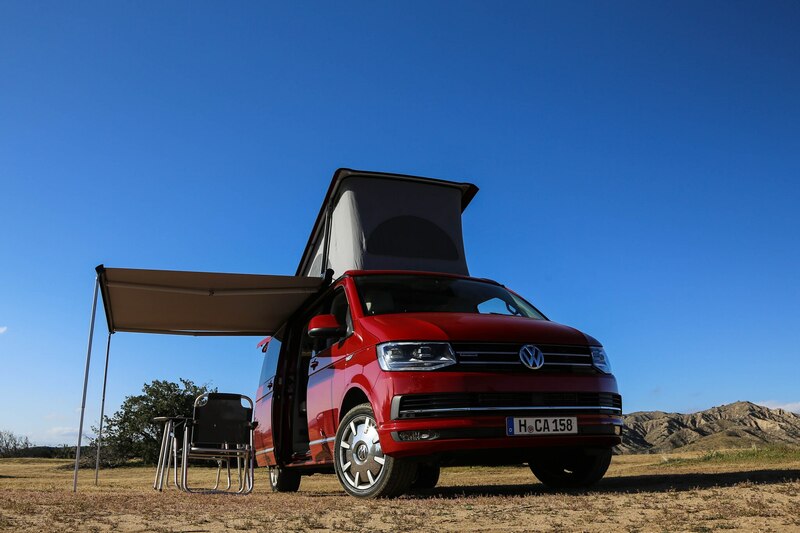 The weather-resistant tarp is supported by two folding braces and a pair of legs that swing out from the outside edge and the fully extended setup holds fast in the face of the whipping winds. 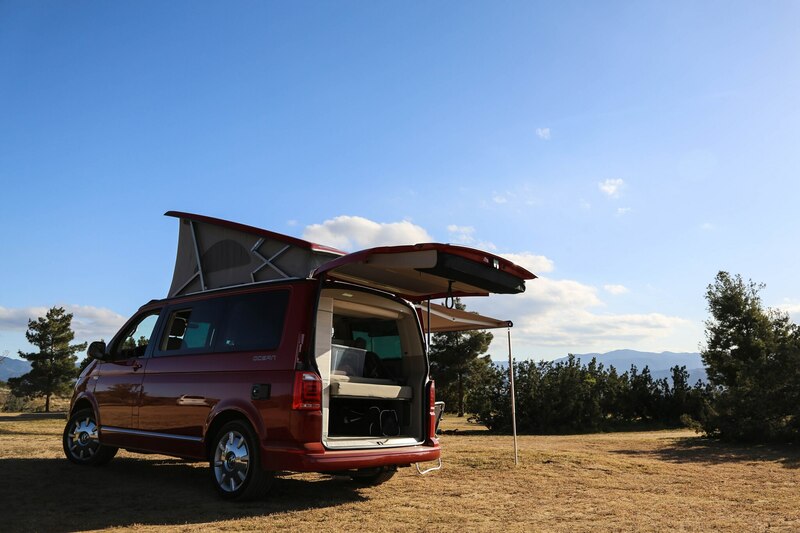 Our dinner is a barbeque, enjoyable partially because of the irony of Germans grilling excellent hamburgers for Americans but also because the protein-heavy meal is a welcome contrast to our meatless lunch. 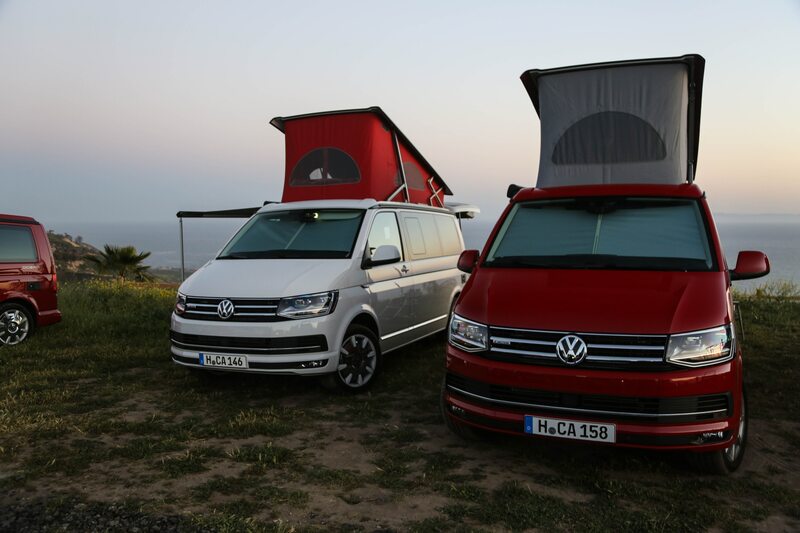 We hide from the gusts in the cabin as Christian, our host from VW, regales us with stories of the previous year’s Nordic adventure. 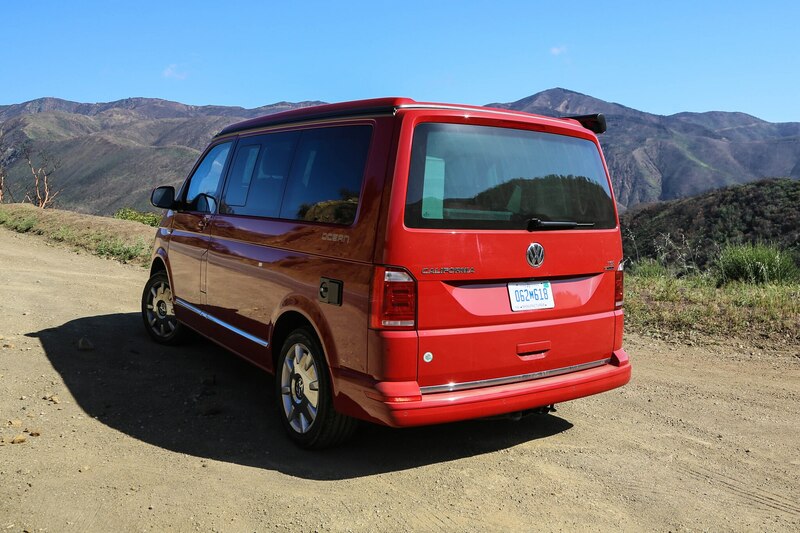 The next day we pack up the camper and hit the road back to Los Angeles without stopping. 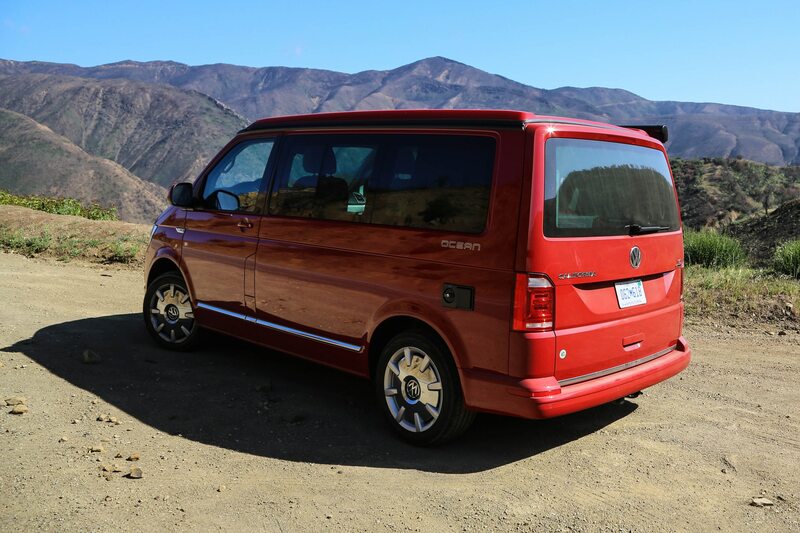 The round trip was close to 350 miles total, and the T6 California did it all on one tank of gas. 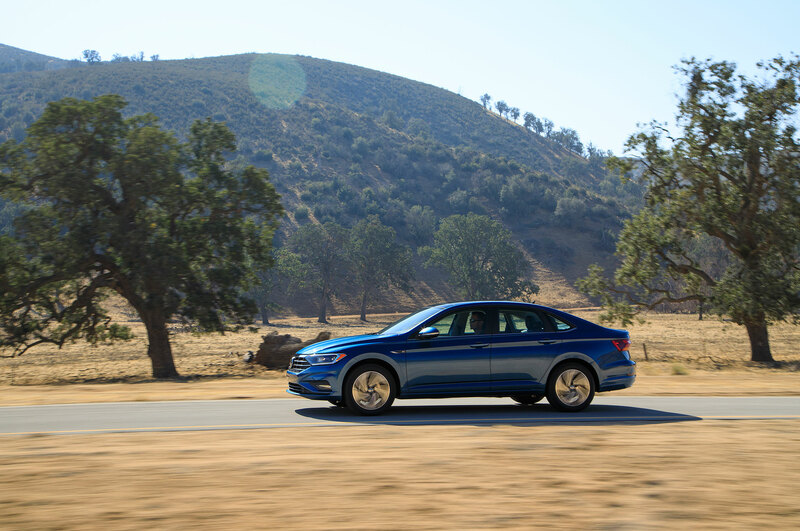 On the way back, we tested out some of the vehicle’s new school tech, including its start/stop feature, lane-keeping assist, forward collision detection, and adaptive cruise control systems. 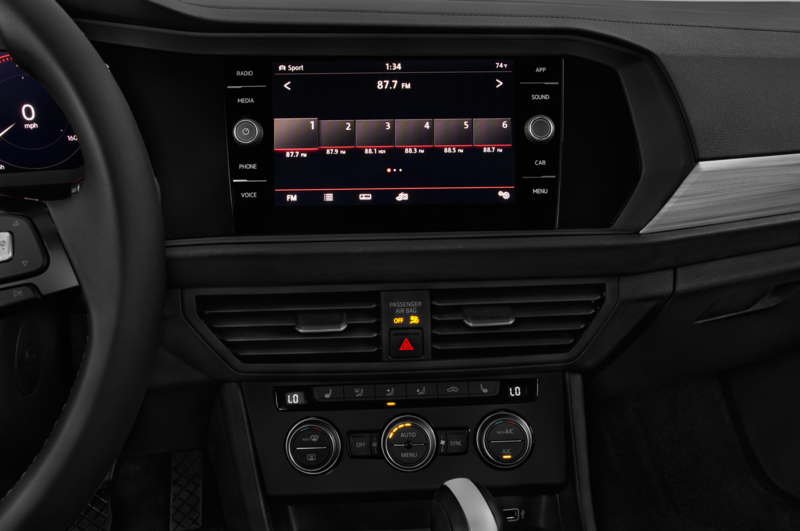 All of them generally performed as well as similar systems we’ve sampled from other automakers. 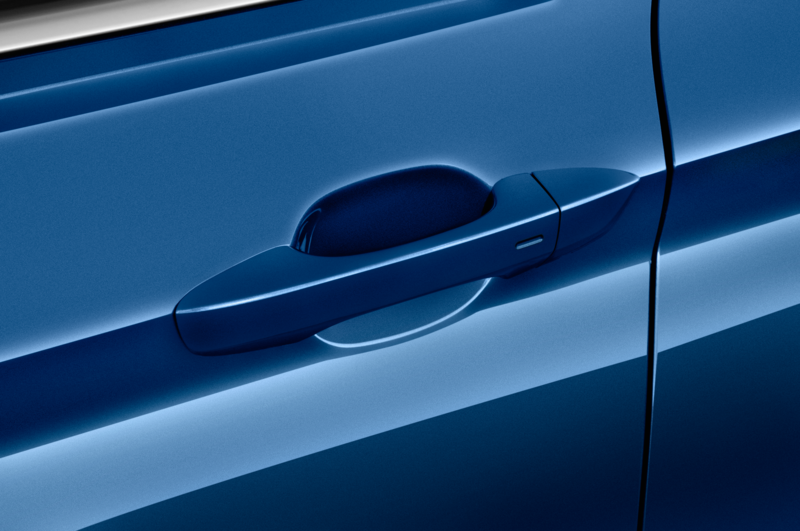 Forward collision did intervene one time and although we thought the application unnecessary, given that it never occurred again it seemed to be on the less-intense side of the sensitivity spectrum. 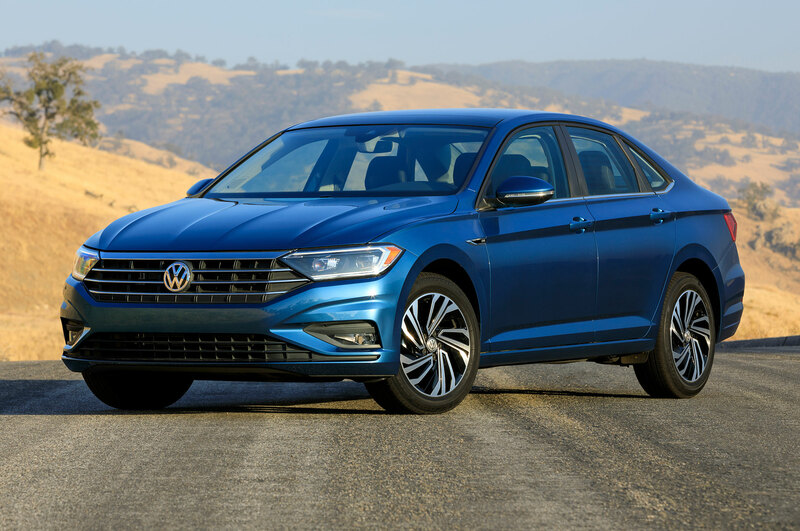 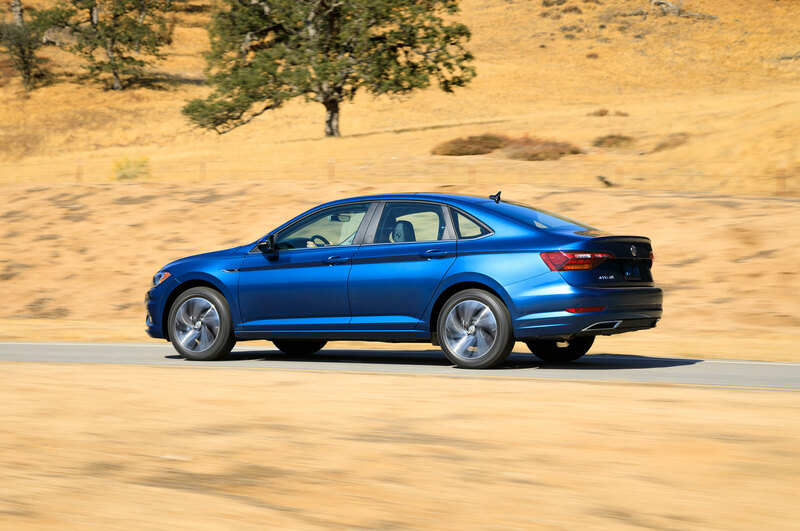 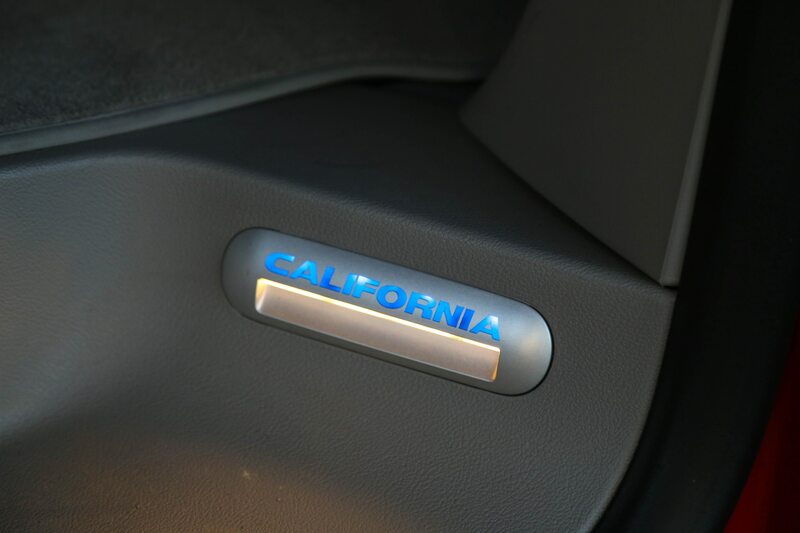 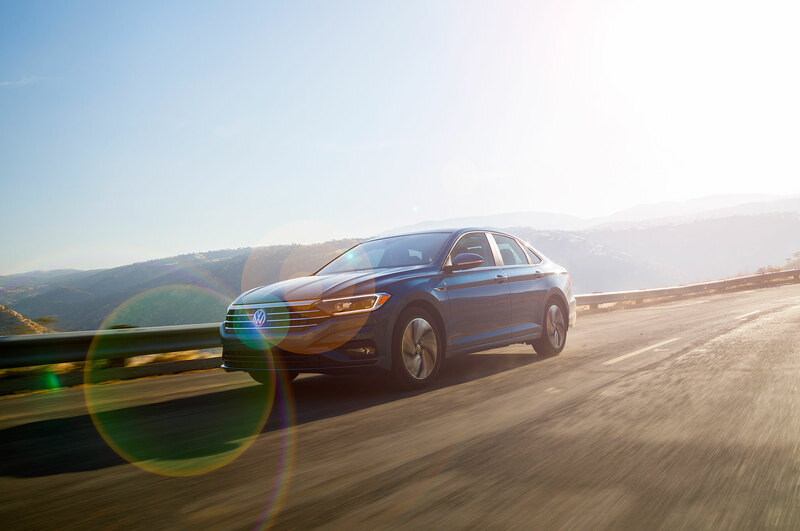 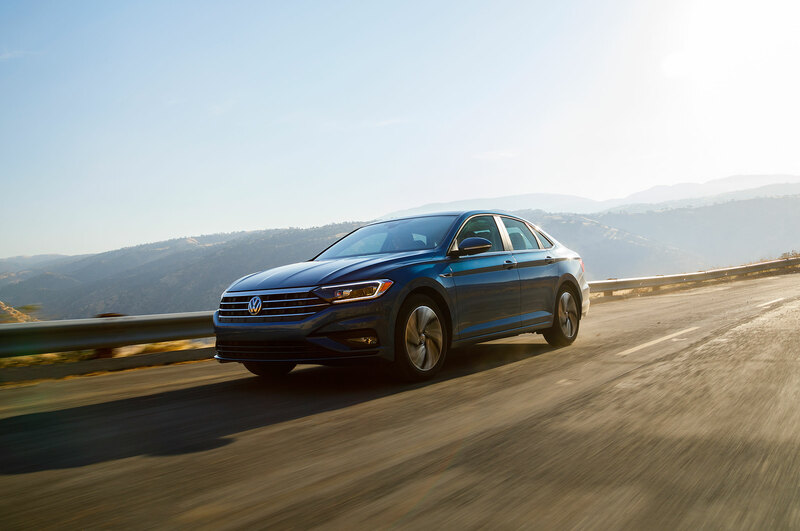 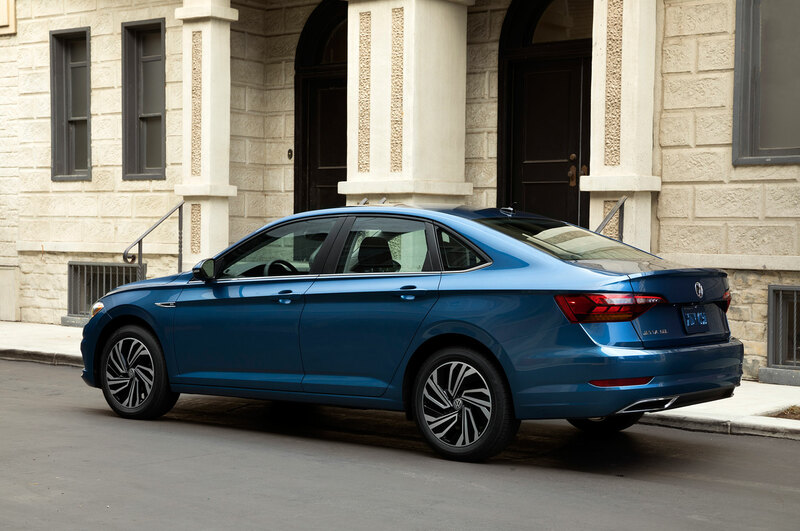 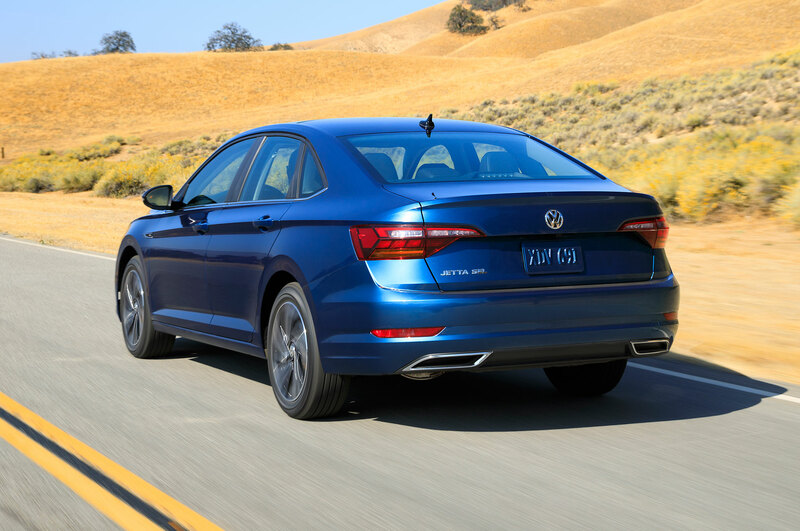 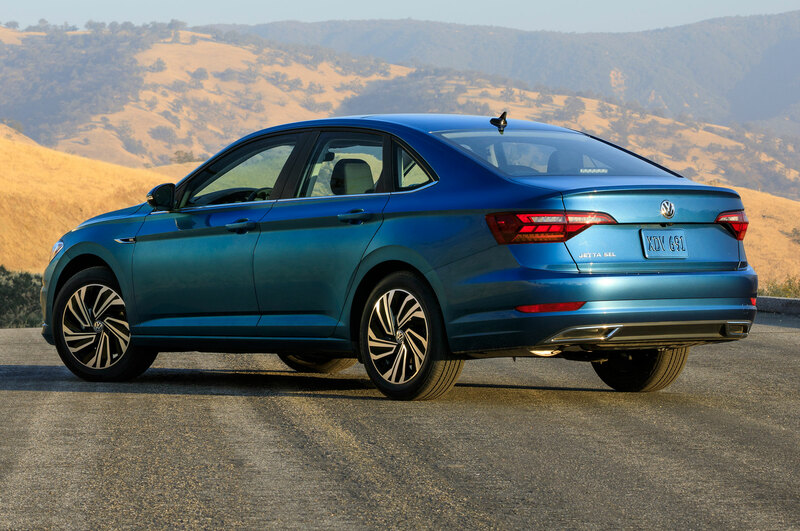 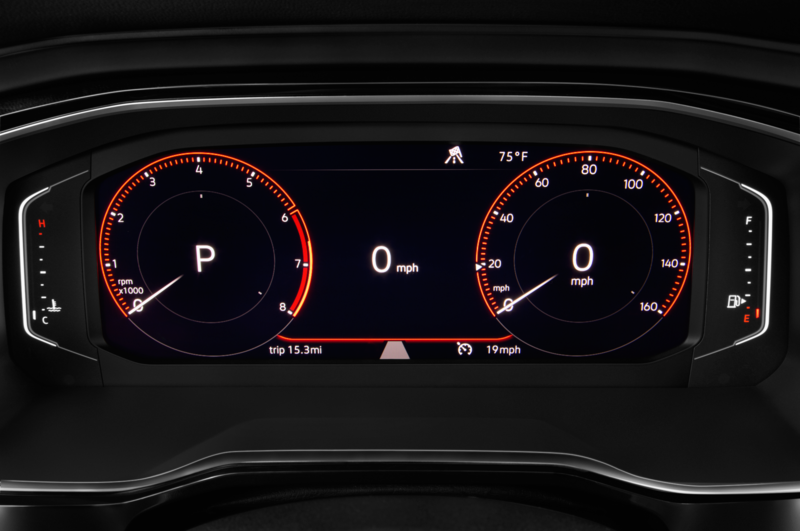 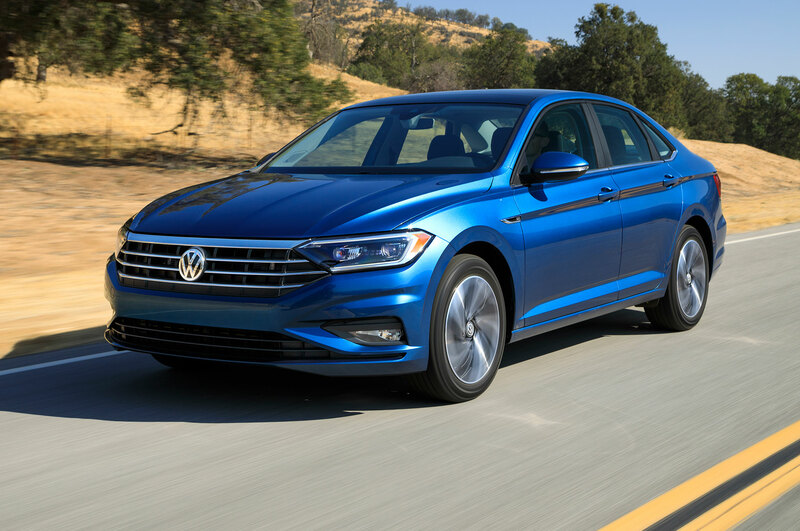 The adaptive cruise feature proved welcome during a stretch of the infamously boring Interstate 5, easily maintaining speed and following distance. 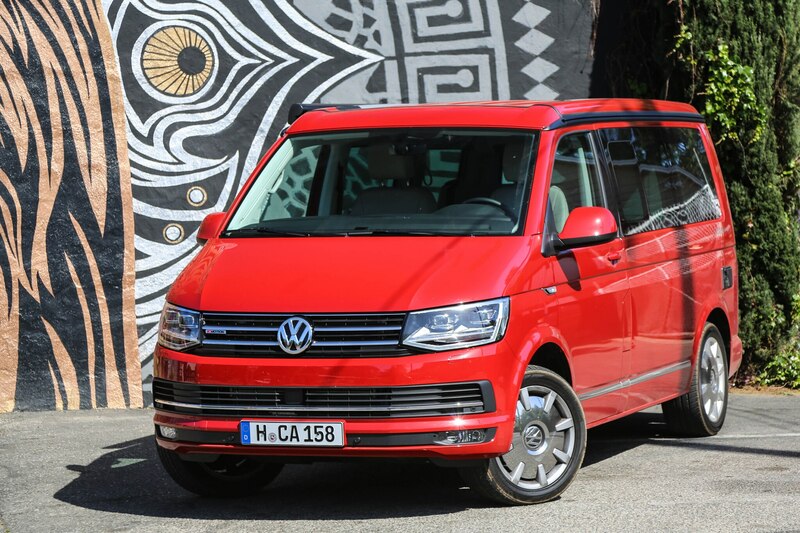 While it certainly seems to us like a no brainer for Volkswagen to bring the T6, especially in California form, to the U.S., there are several hurdles, chief among them price. 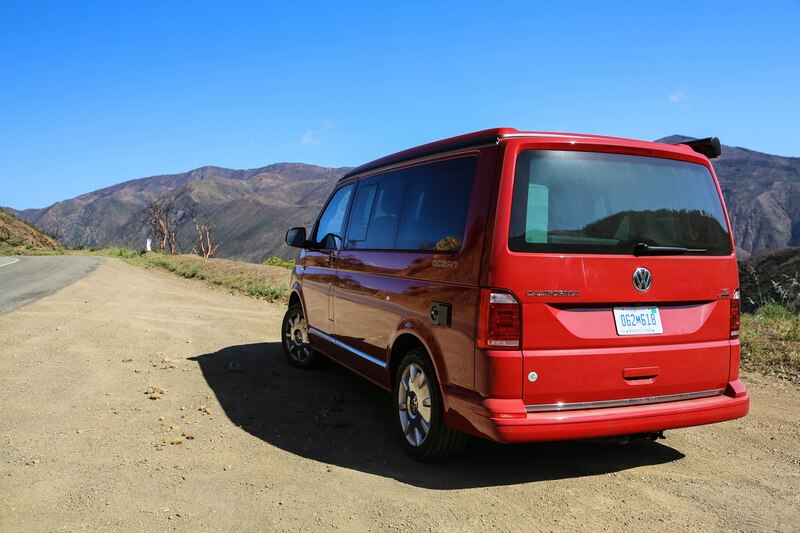 Our California Ocean vans were optioned up to somewhere in the neighborhood of a whopping $110,000 (converted from Euros to dollars by Volkswagen). 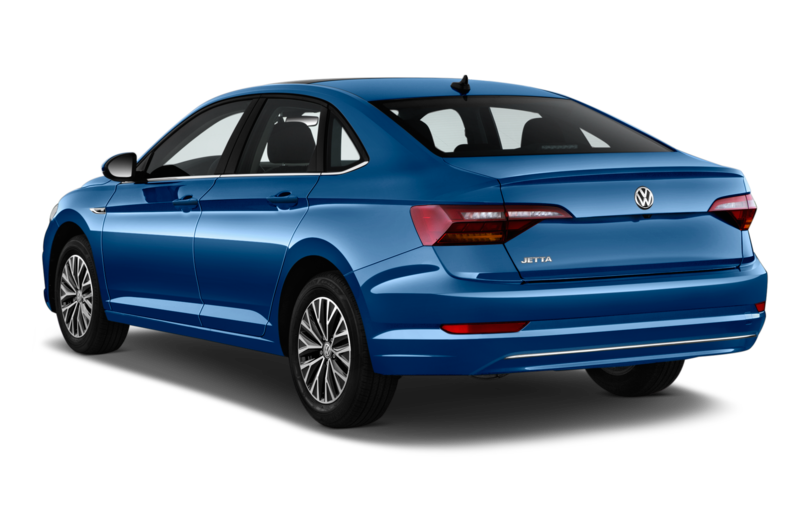 That said, several, less expensive variants could probably be had in the mid $40k range if brought here, but you wouldn’t be getting the kitchen sink. 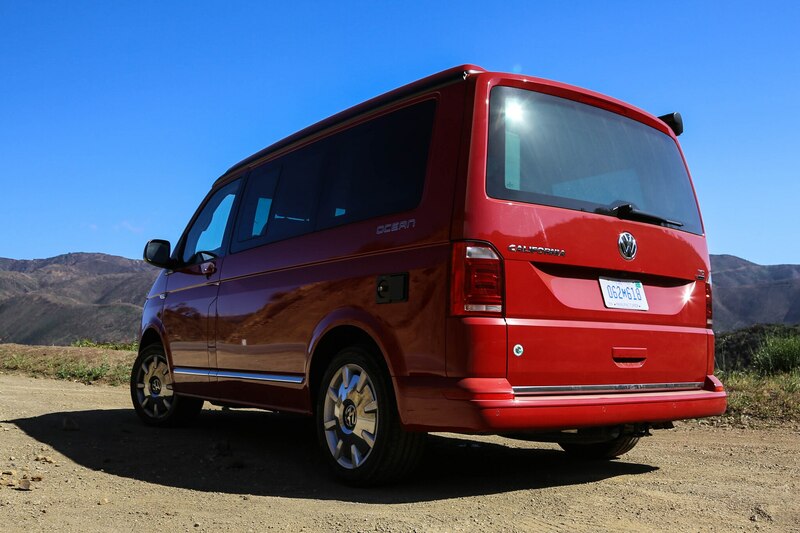 Further making the case for VW to bring the T6 to the States was that we were stopped by everyone from beach bums to the finer folk of Malibu during our journey. 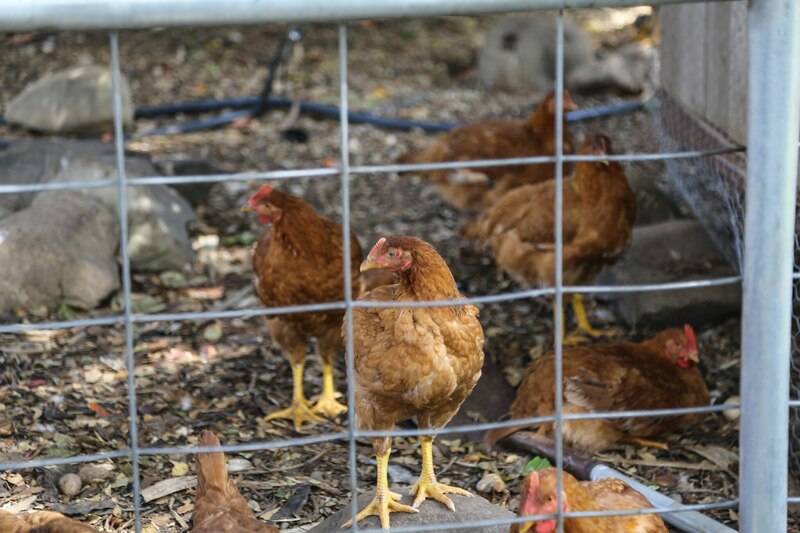 They peppered us with questions, wondered aloud where they could get one. 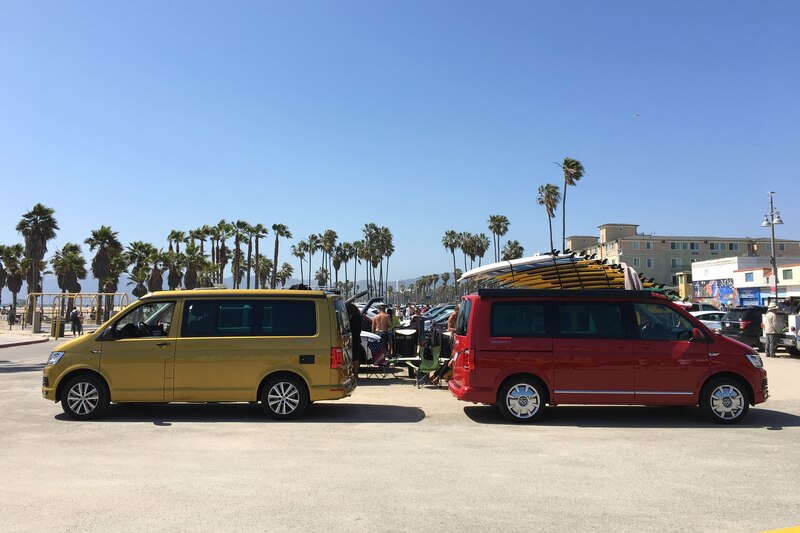 It proved an eye-opening experience that reinforced just how much the Volkswagen van has been seared into the national consciousness—at least out here on the left coast. 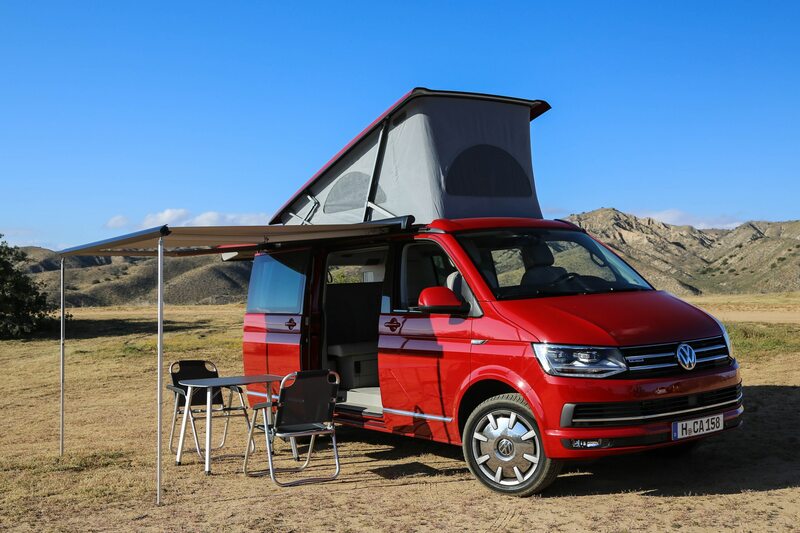 Volkswagen gave the California a proper 30th anniversary bash, and now we’re more eager than ever to see the German camper make a return. 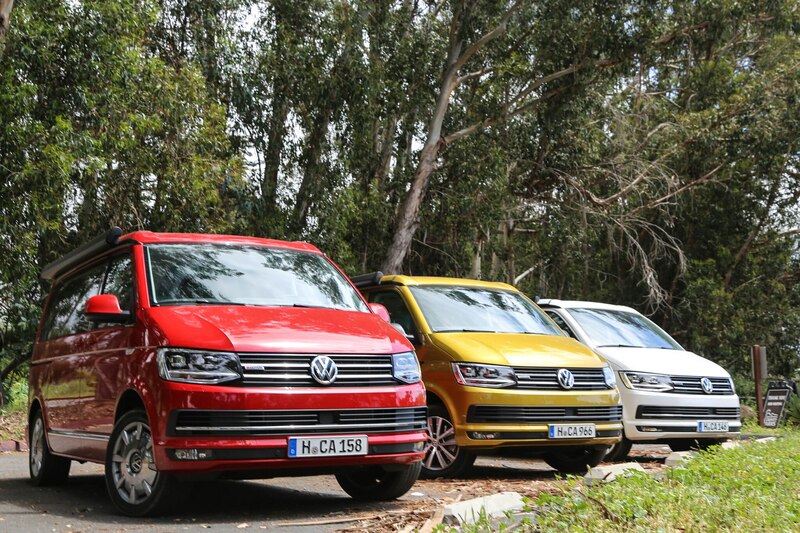 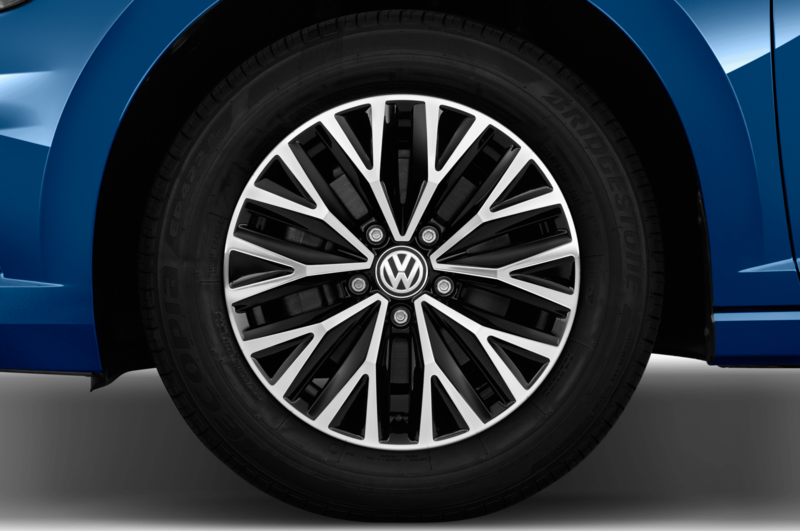 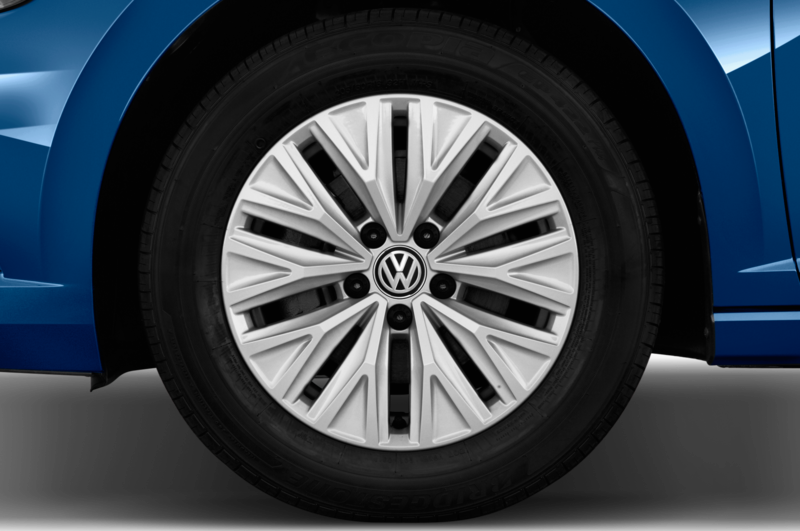 Thanks a lot for whetting our appetite, Volkswagen.